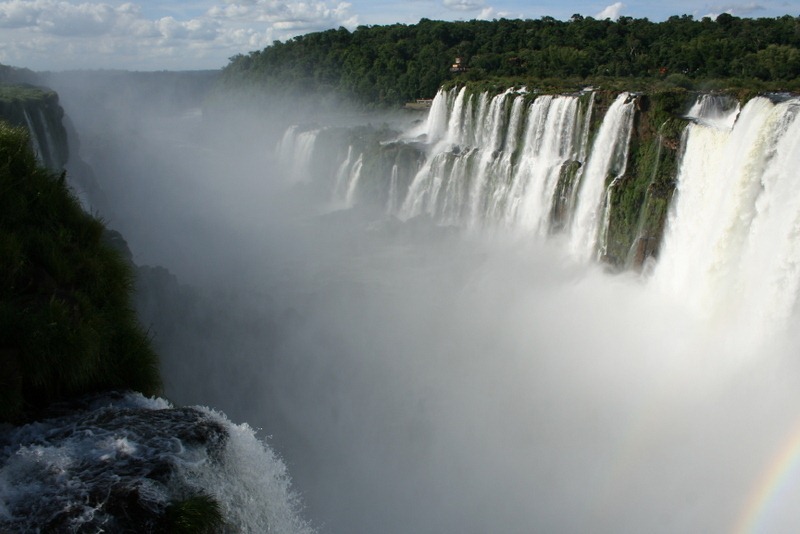 This updates an article I posted in 2010, with photos showing different views of mighty Iguazu Falls and Victoria Falls. Click here to read the original article. 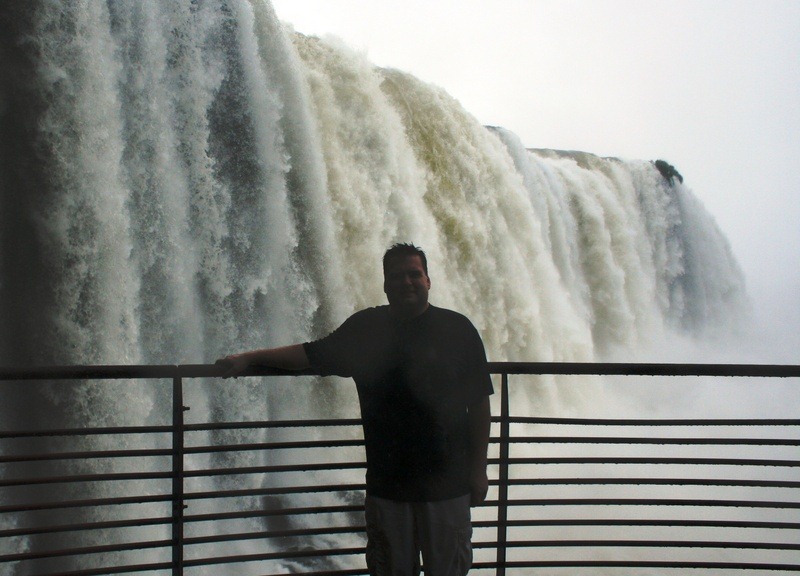 I’ve had the rare opportunity to visit two of the world’s great waterfalls, Iguazu (Iguaçu) Falls on the Argentina-Brazil border in South America and Victoria Falls (Mosi-Oa-Tunya) on the Zambia-Zimbabwe border in Africa. 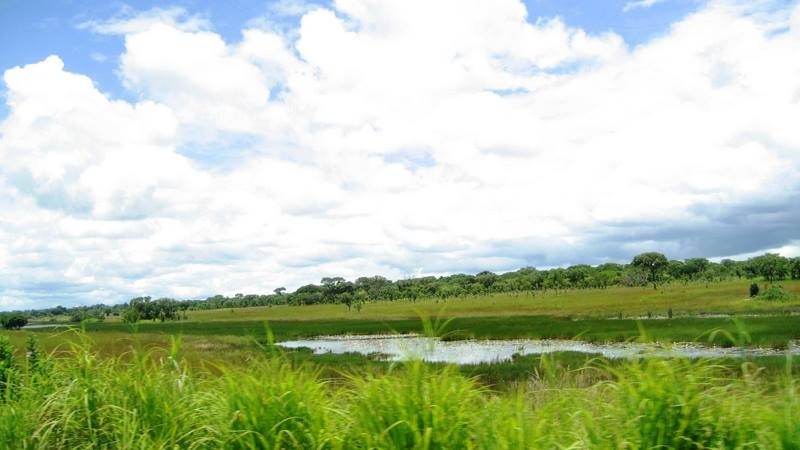 Each was just a few hours’ drive from my former homes in Asunción, Paraguay and Lusaka, Zambia, respectively, and I visited them often. 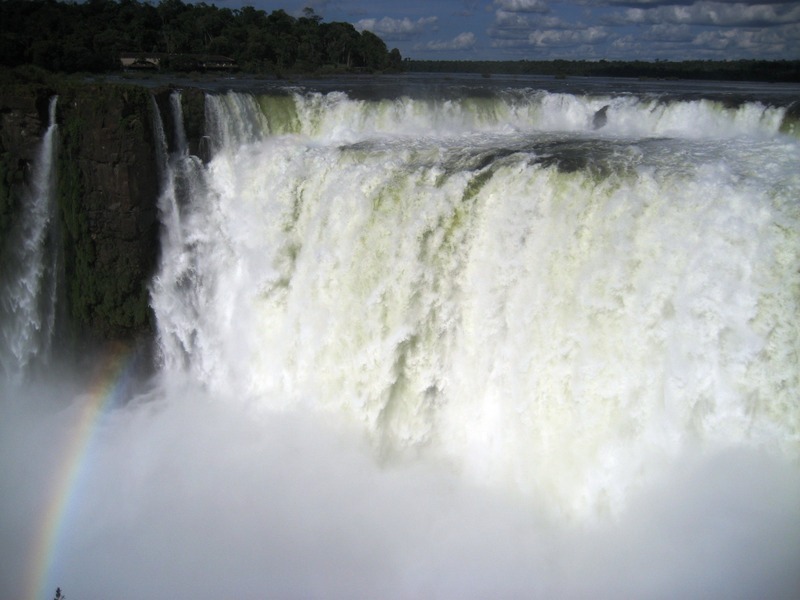 As measured by water volume, both are the two largest and arguably most spectacular waterfalls in the world. It’s easy to conclude when you visit one that it’s more impressive than the other. 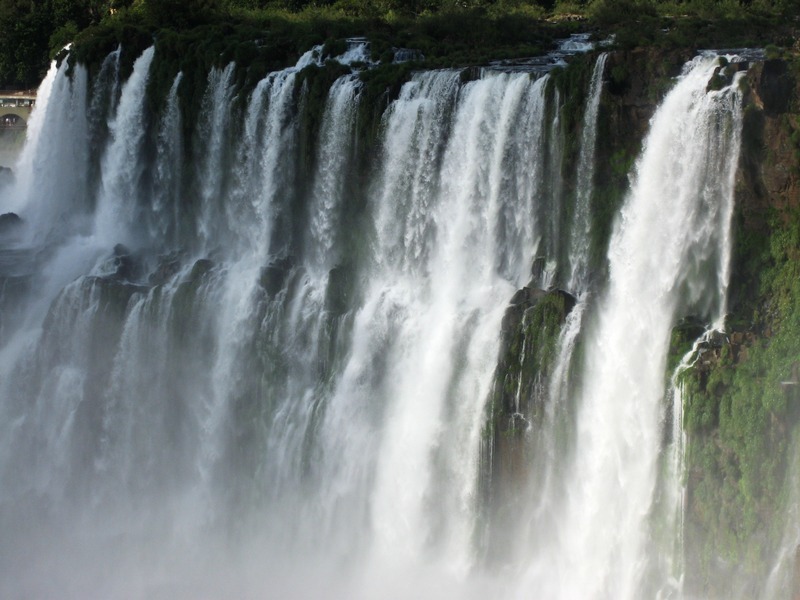 Some claim that Iguazu Falls is better while others prefer Victoria Falls. 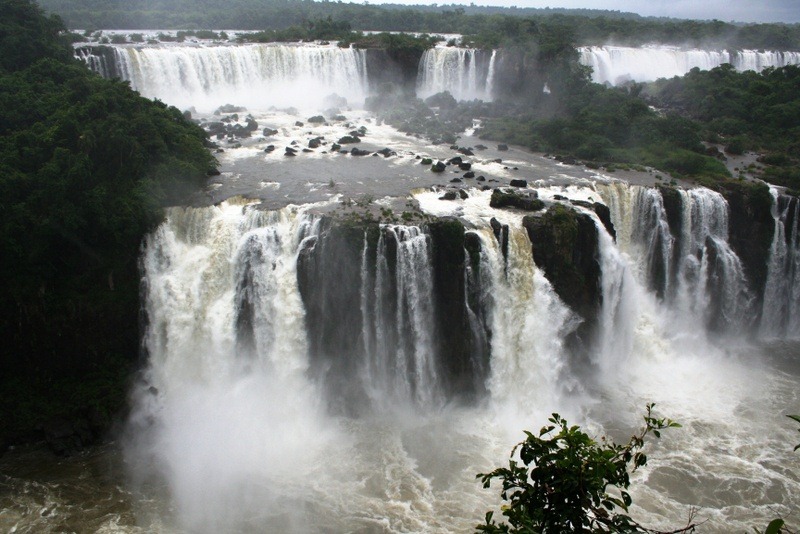 Iguazu Falls is one of the New Seven Wonders of Nature and is the wider of the two with cascades that look like bridal veils. 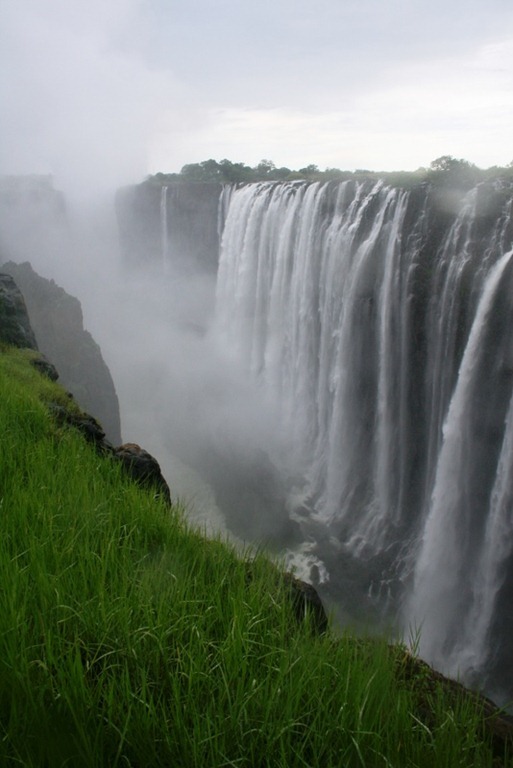 Victoria Falls, a World Heritage Site, is higher with a massive curtain of water during the rainy season that disappears in the dry season. 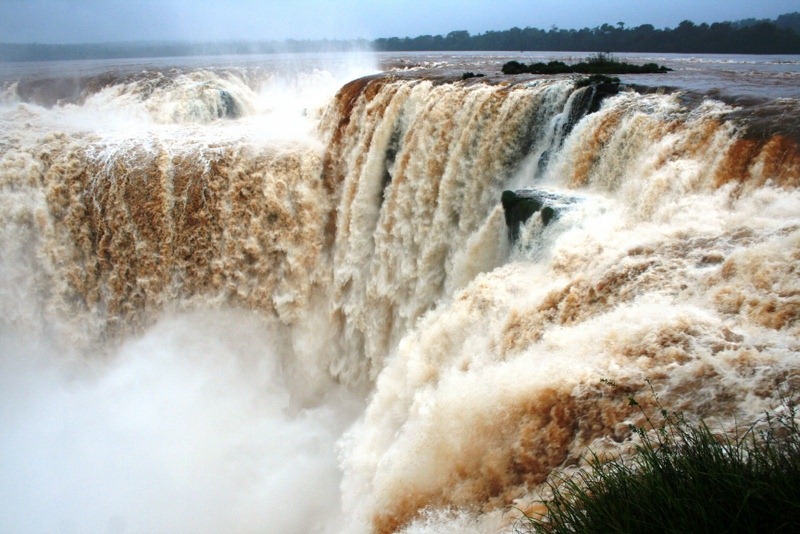 Iguazu has the “Devil’s Throat,” a narrow falls where the water crashes into a torrential pool, and Victoria the “Devil’s Pool,” a whirlpool at the edge of the falls where visitors can swim during the dry season. One is in Africa and the other in South America, lending geographical biases in favor of one or the other. What do you think? 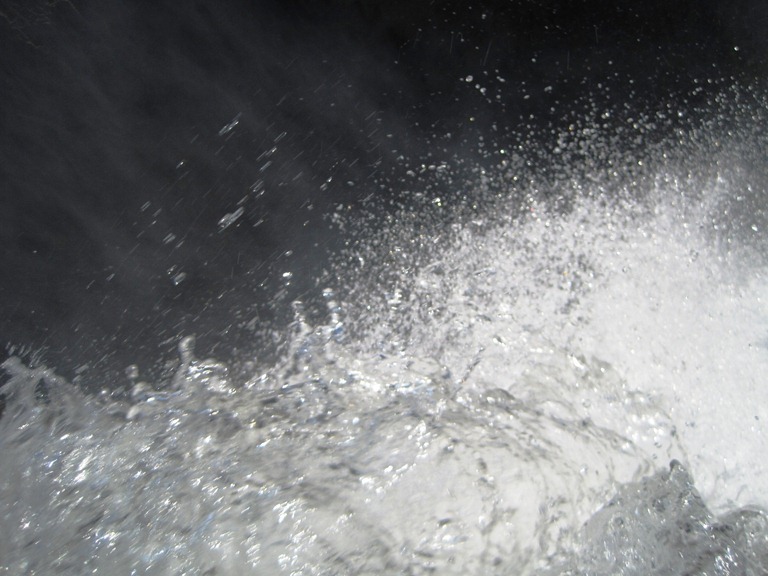 Here are photos of each waterfall at different times of the year. Decide for yourself. 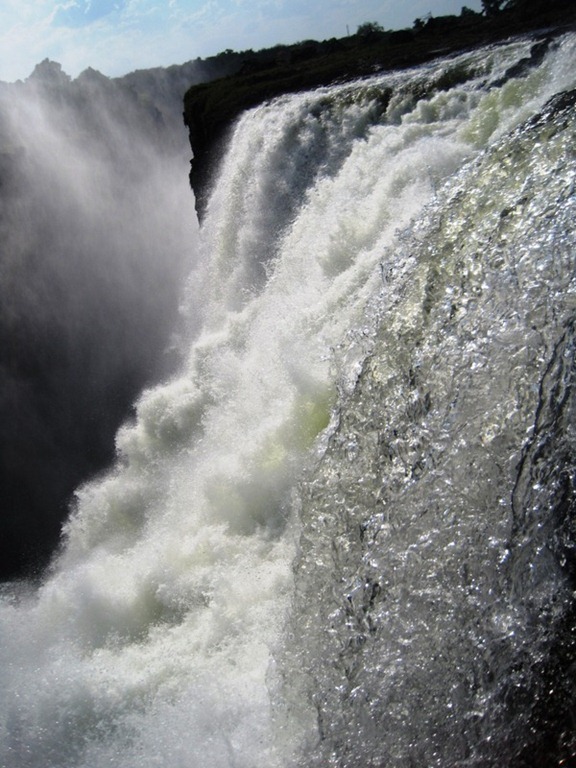 After browsing through the photos, vote for your favorite waterfall at the bottom of this post. Vote for your favorite now and post your comments below! This poll is unscientific and has a margin of error of +/- 100%. 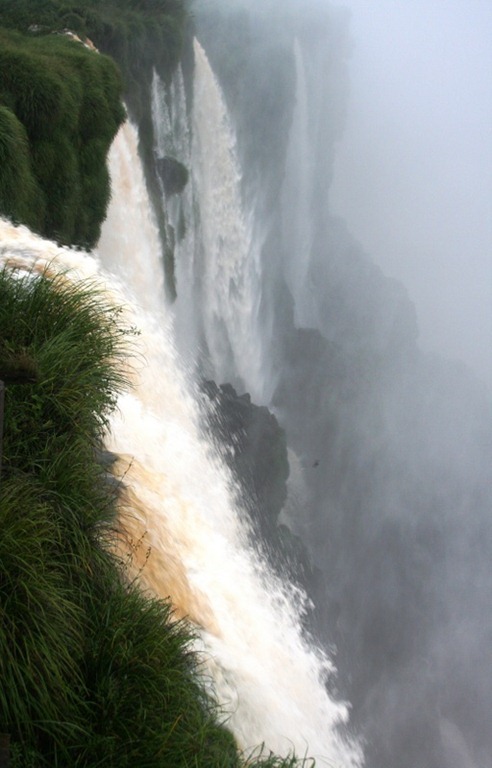 Which waterfall do I think is more impressive? Click here to find out. Clang! The car bounced on the dirt road. We’re on our way to see a lion! When it was two hours later, it felt like two years. We stopped at 6 o’clock to stop and see the sunset. After an hour, we went to see a lion. 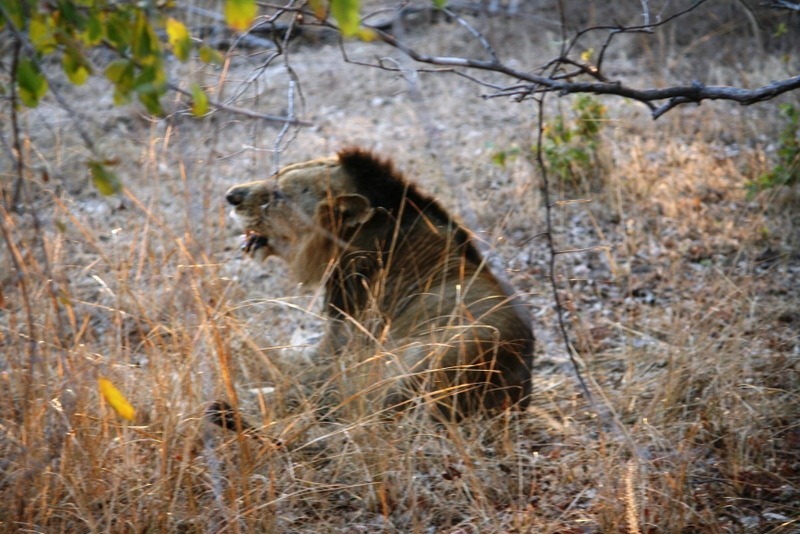 When we saw the lion, I was scared and surprised. It was cute and cuddly, but I wouldn’t go out and cuddle with it. It was the best day ever. I wish I could see the lion again. 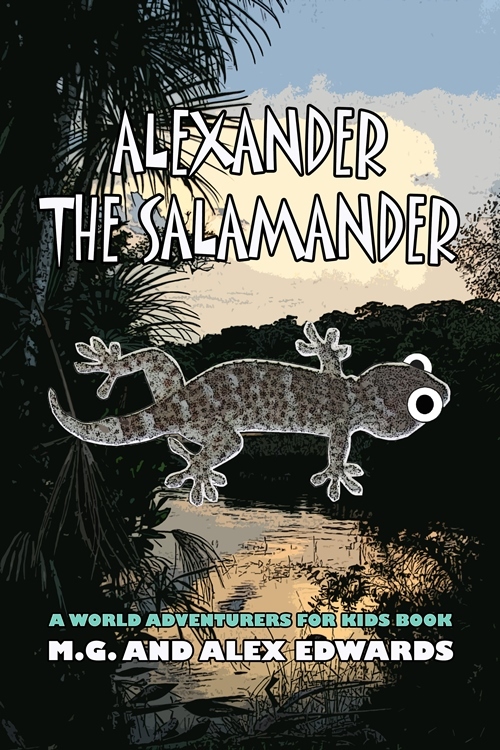 Note: This story was written by my young son, Alex, after our June 2011 trip to South Luangwa National Park in Zambia, a country in Southern Africa. 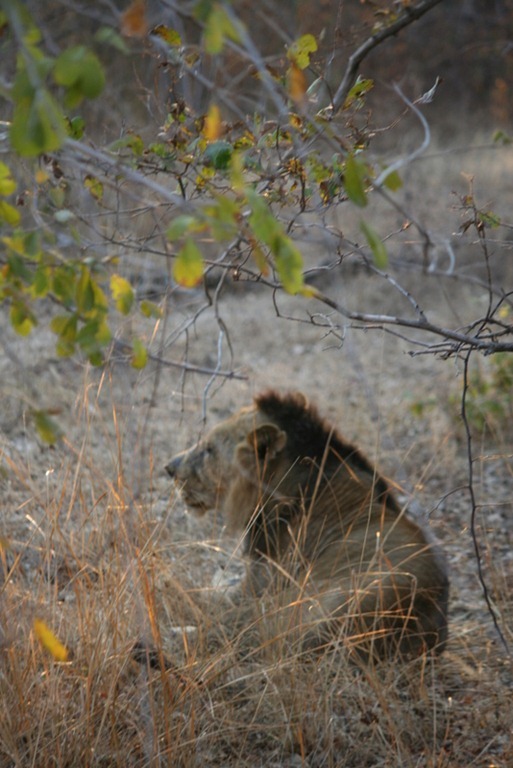 The lion in the photo is the same one that inspired him to write this story. M.G. Edwards is a writer of books and stories in the mystery, thriller and science fiction-fantasy genres. He also writes travel adventures. He is author of a collection of short stories called Real Dreams: Thirty Years of Short Stories available as an ebook and in print on Amazon.com. His next book, Kilimanjaro: One Man’s Quest to Go Over the Hill, will be released on March 31, 2012. 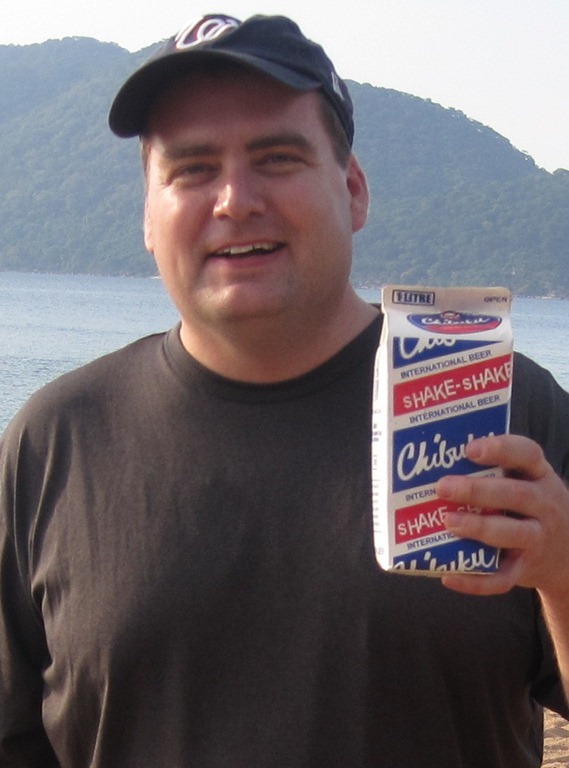 He lived in Zambia during 2009-11 and now lives in Bangkok, Thailand with his wife Jing and son Alex. 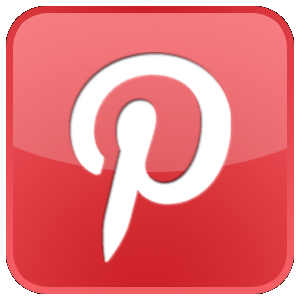 Update 4/3/12: Many thanks to WordPress for promoting this post to Freshly Pressed! And thanks to everyone stopping by to visit World Adventurers and say hello. You’re most welcome. 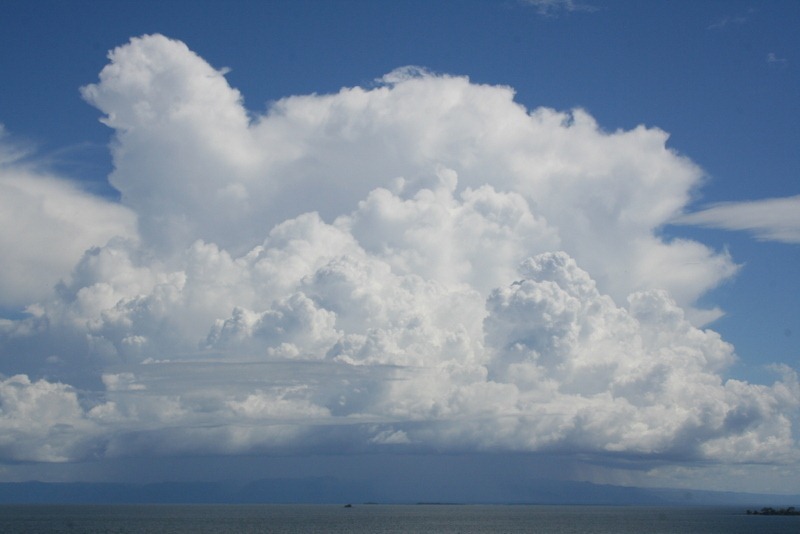 There are more than 825 posts on travel and other topics for your reading enjoyment listed in the Category Cloud below. Enjoy! 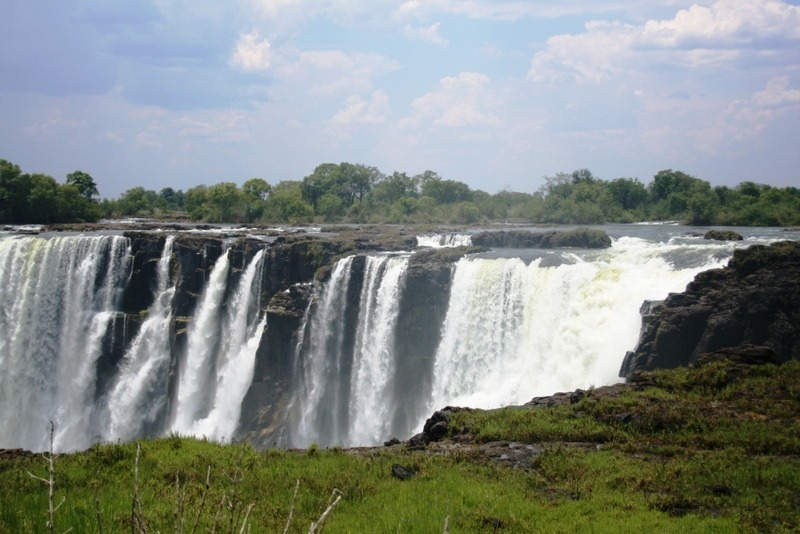 Here’s a list of the top ten things you should do if you visit Zambia, a country in Southern Africa. 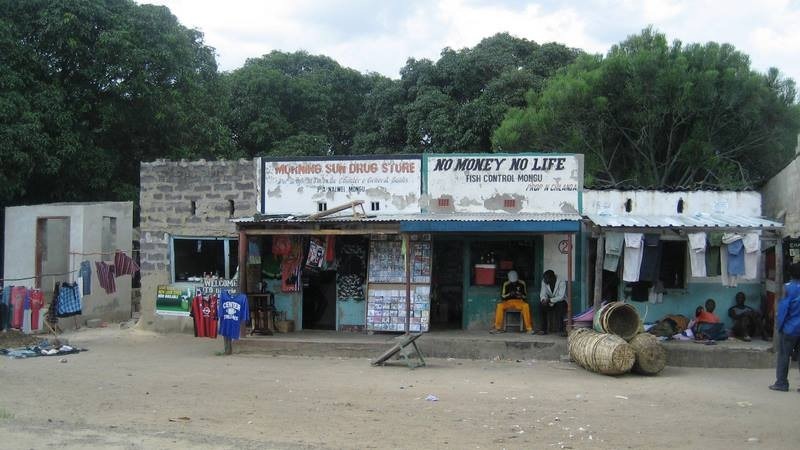 Zambia lies southwest of Tanzania, which is featured in my book Kilimanjaro: One Man’s Quest to Go Over the Hill. 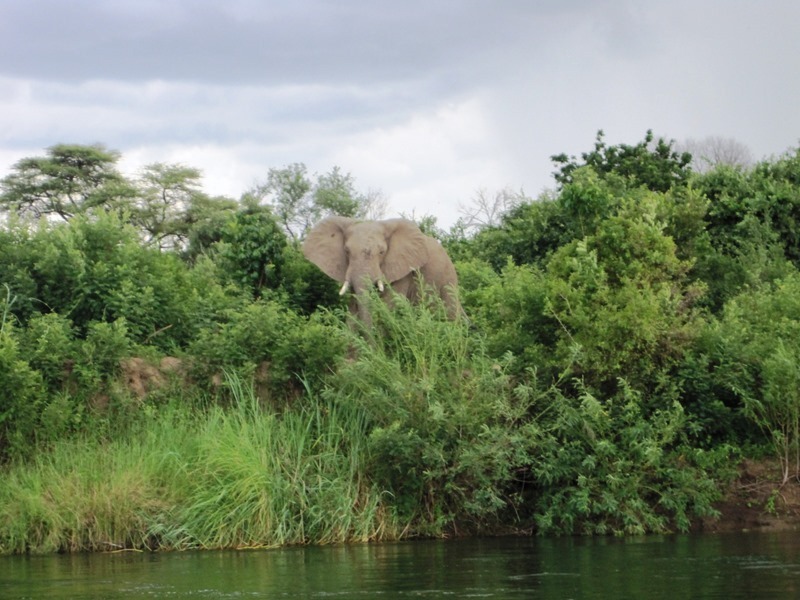 The two countries are similar in many ways, with plenty of opportunities to see amazing natural beauty, go on thrilling wildlife safaris, and experience Africa’s unique culture. 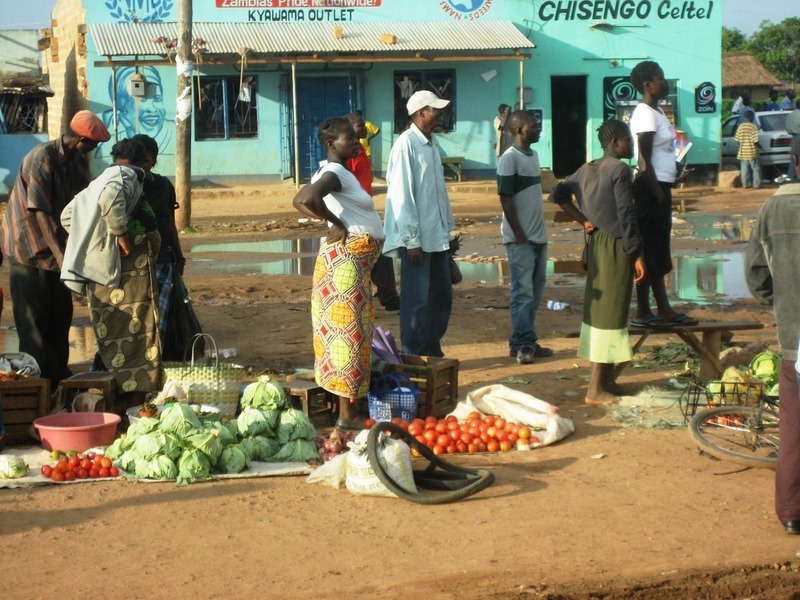 This list is based on my own experiences when I lived in Lusaka, Zambia’s capital and largest city. These activities and destinations will give you a taste of what this interesting country has to offer. 1. 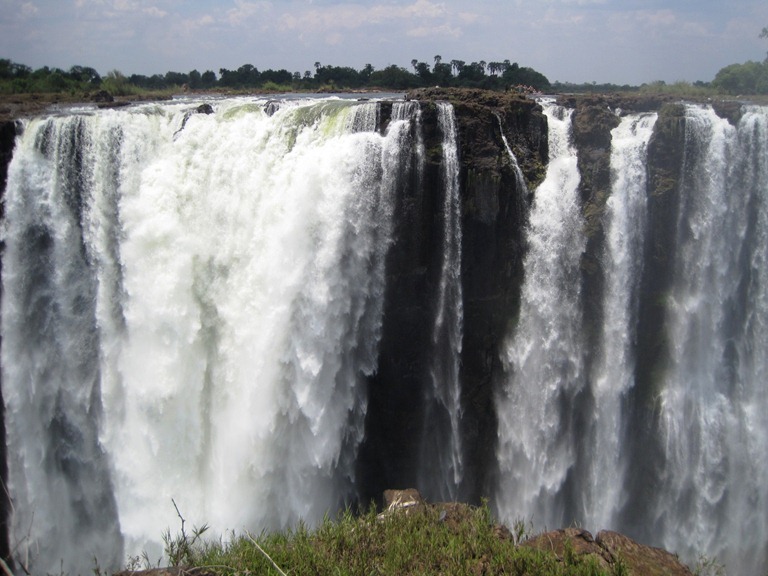 Victoria Falls/Mosi-oa-Tunya (Zambia/Zimbabwe): Arguably the world’s largest waterfall, Victoria Falls in Southern Province never ceases to amaze visitors. 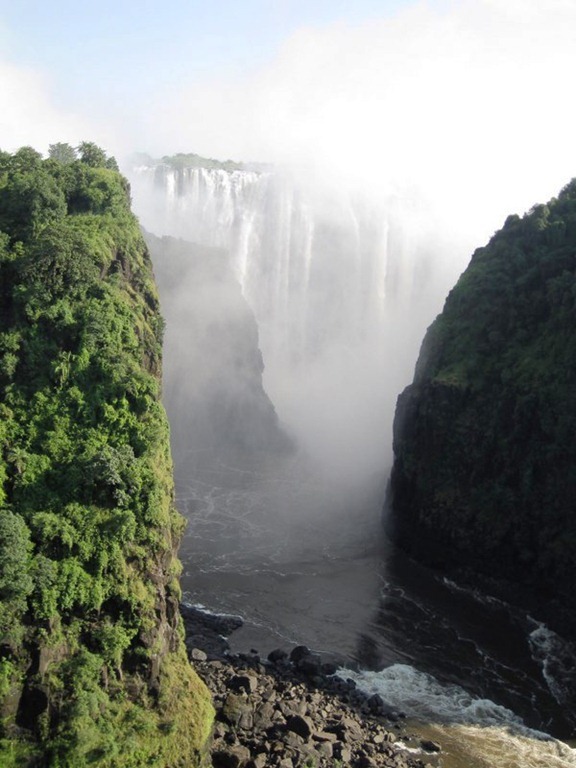 This is Zambia’s — and Zimbabwe’s — biggest tourist attraction. 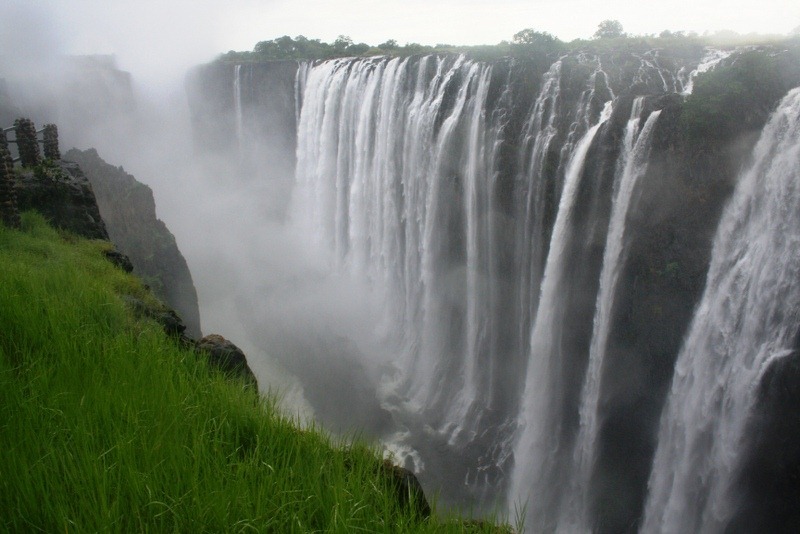 It lives up to its local (Tongan) name, Mosi-oa-Tunya, meaning “The Smoke that Thunders.” Most visitors stay in the nearby towns of Livingstone, Zambia or Victoria Falls, Zimbabwe. 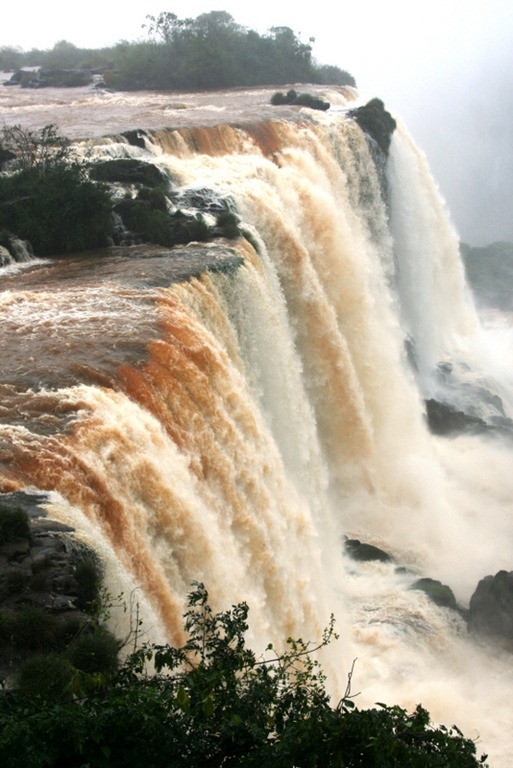 The upper falls is in Zambia, while the lower portion is on the Zimbabwe side. 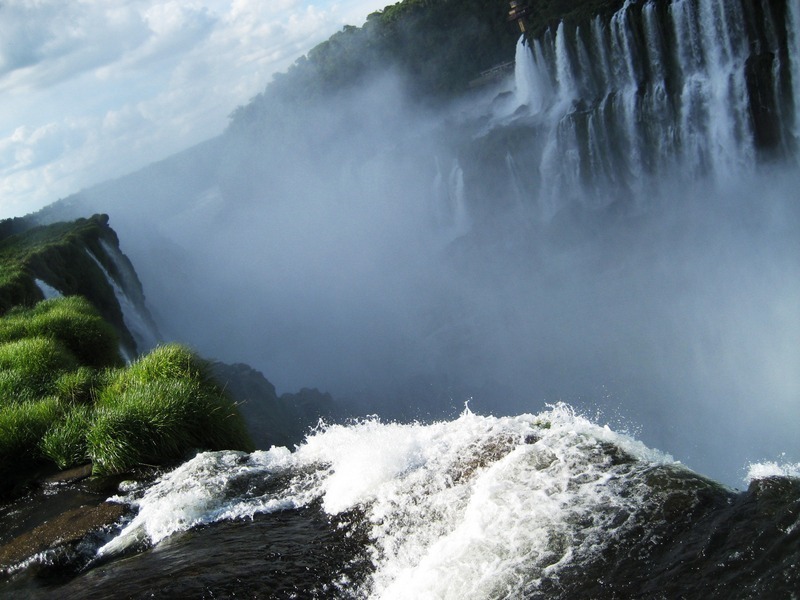 Both offer different and spectacular views of this natural wonder. 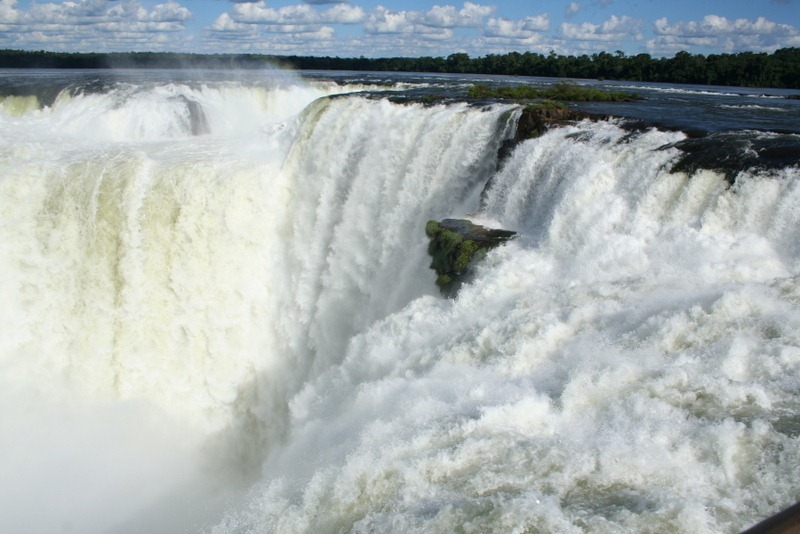 Of special note are the two statues of the explorer and missionary David Livingstone (1813-73) locate on each side of the falls. 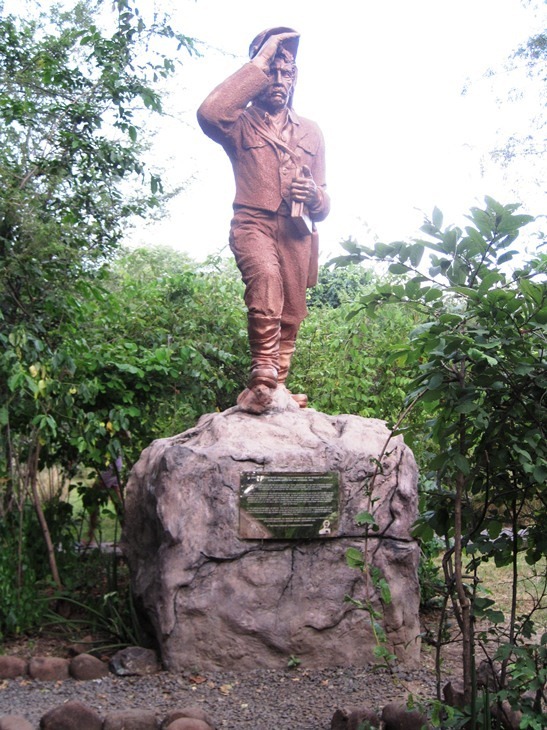 Livingstone is still revered by many Zambians, and the City of Livingstone is named after him. 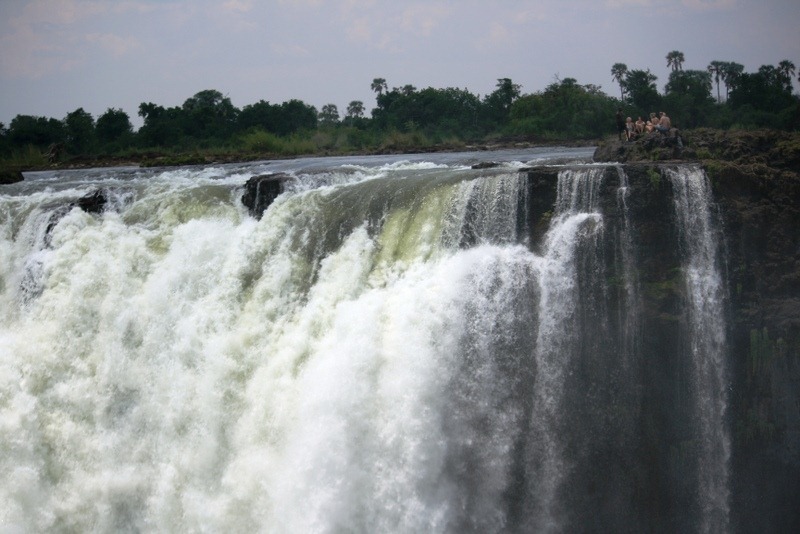 The best time of the year to visit the falls is between July and September, when the Zambezi River is aplomb with water. 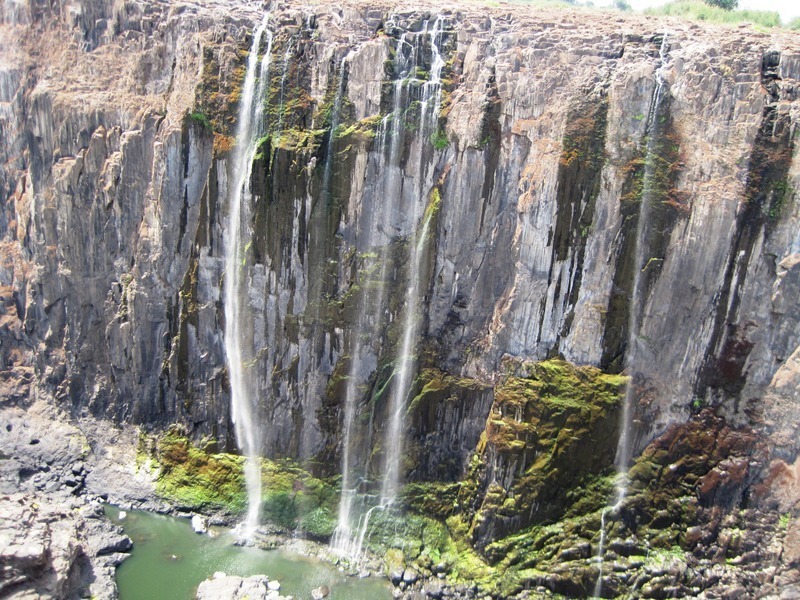 In November and December, the falls are almost dry and look like a canyon. 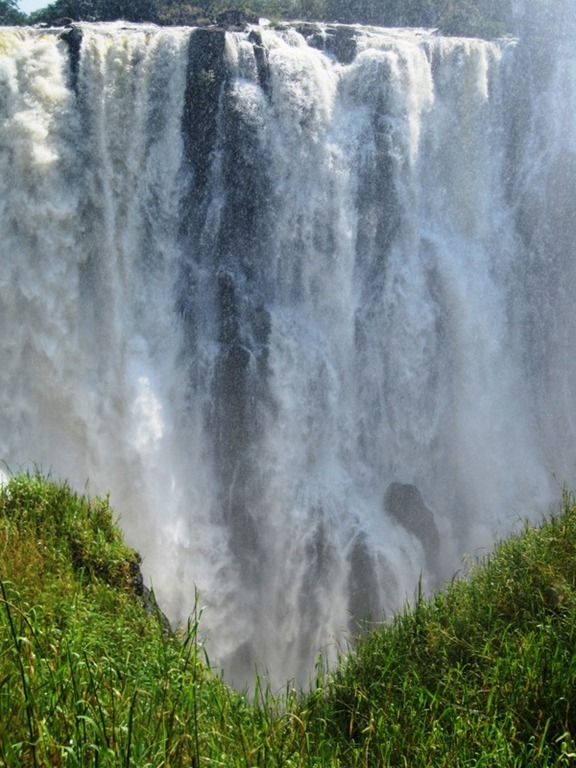 Heavy rainfall fills the Zambezi between January and May, and it’s difficult to see the falls through a wall of mist created by falling water. 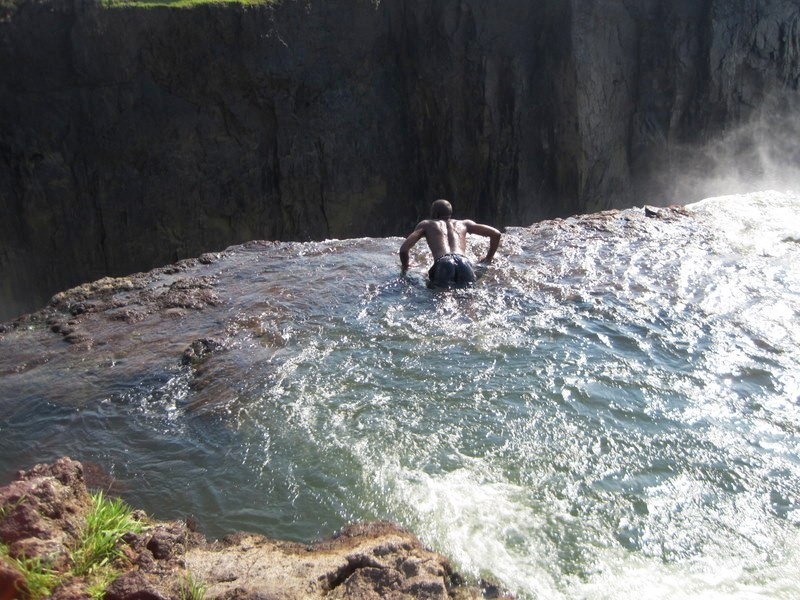 For a few weeks in November, the water level is so low that visitors can swim in the “Devil’s Pool.” It’s an experience of a lifetime and highly recommended if you visit at that time. 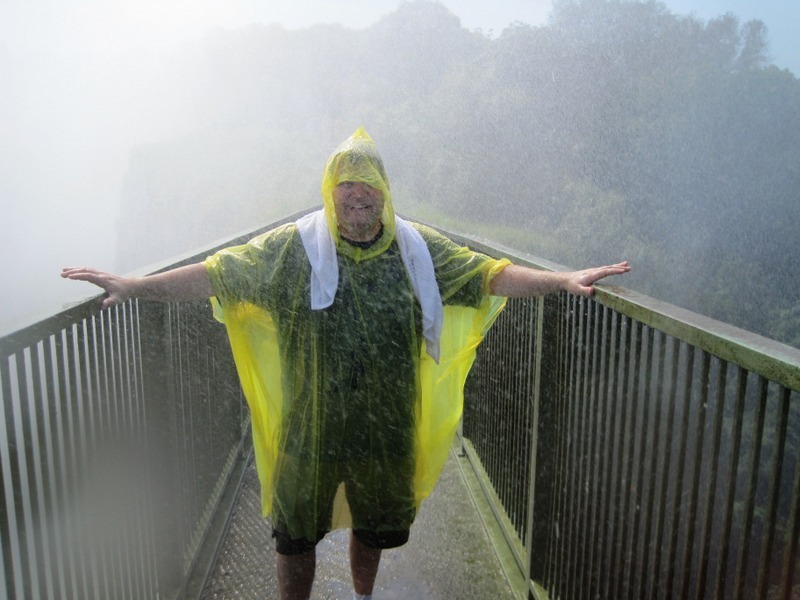 The pool lies at the edge of the falls with a 105-meter (350 foot) drop on the other side. 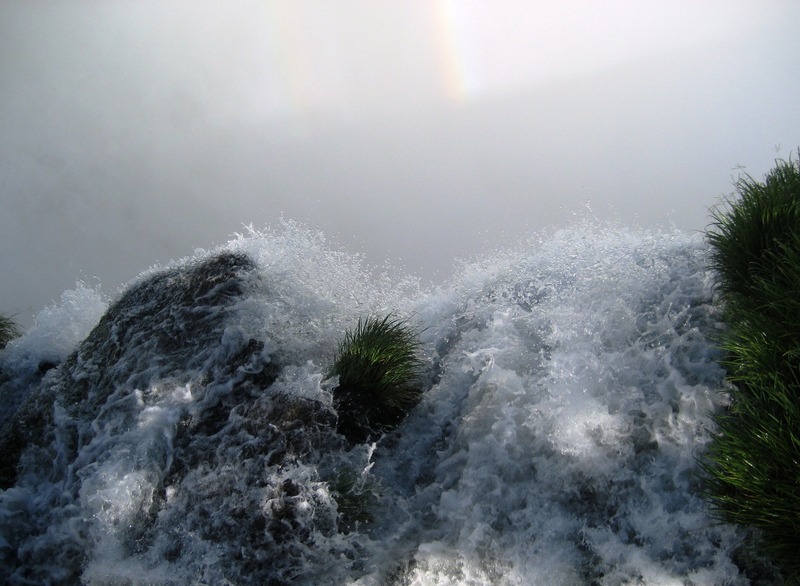 Although it looks terrifying, the Devil’s Pool offers brave souls the sensation of swimming in a whirlpool bathtub. 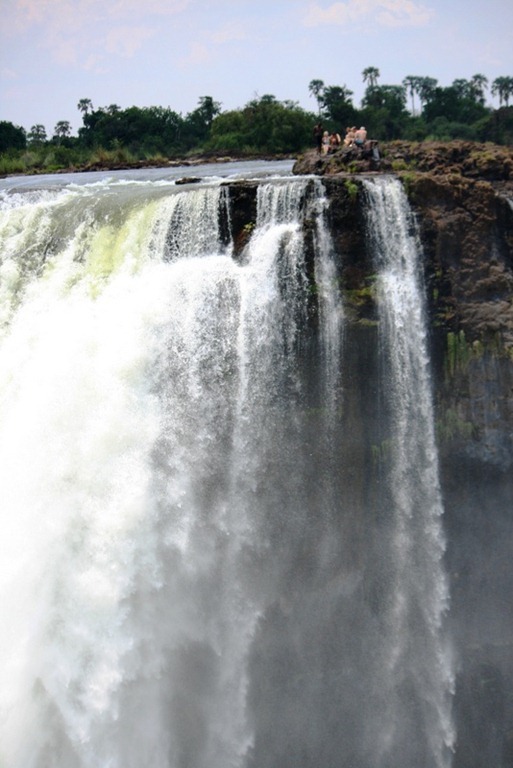 If you’re an adventurous sort, there’s also bungee jumping or zip lining from the Victoria Falls Bridge and whitewater rafting in some unruly rapids below the falls. Keep in mind that these activities can be dangerous. In January 2012, an Australian woman nearly died when she bungee jumped off the bridge and the cord snapped, sending her plummeting more than 110 meters (360 feet). Thankfully, she survived both the plunge and the crocodiles below. 2. 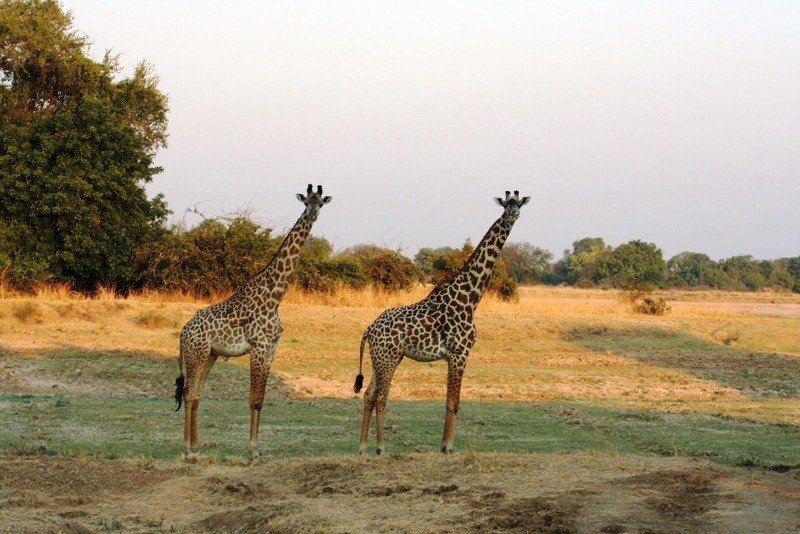 South Luangwa National Park: South Luangwa National Park is one of many national parks in Zambia, and the most popular, because it’s filled with abundant wildlife. 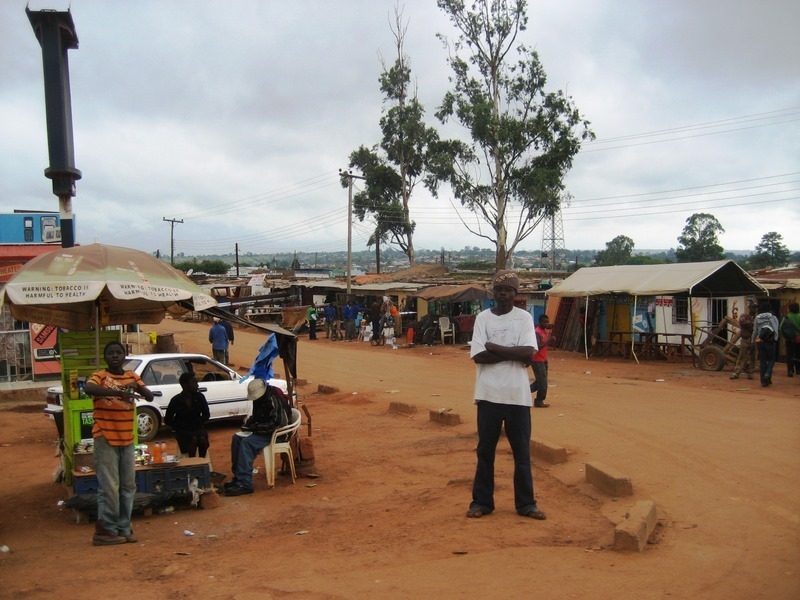 It’s a short flight or a ten-hour drive from Lusaka via Eastern Province. Flying is more convenient but can be expensive. 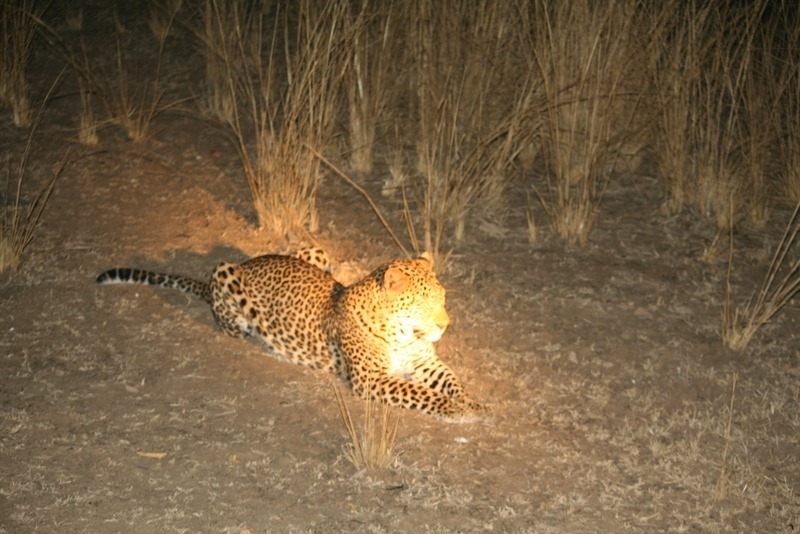 The daytime and nighttime game drives in South Luangwa are fabulous. 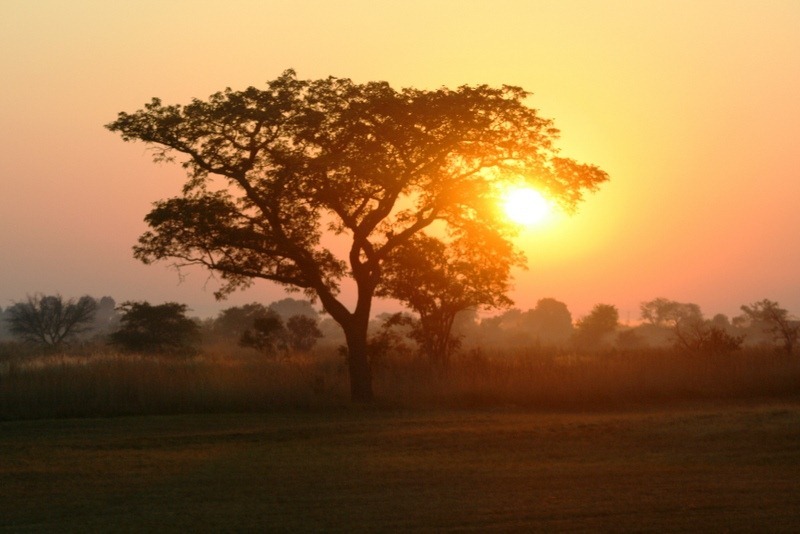 For high-end lodging, stay at the Chichele Lodge, the presidential retreat of former Zambian president Kenneth Kaunda (1964-91), or at Mfuwe Lodge. 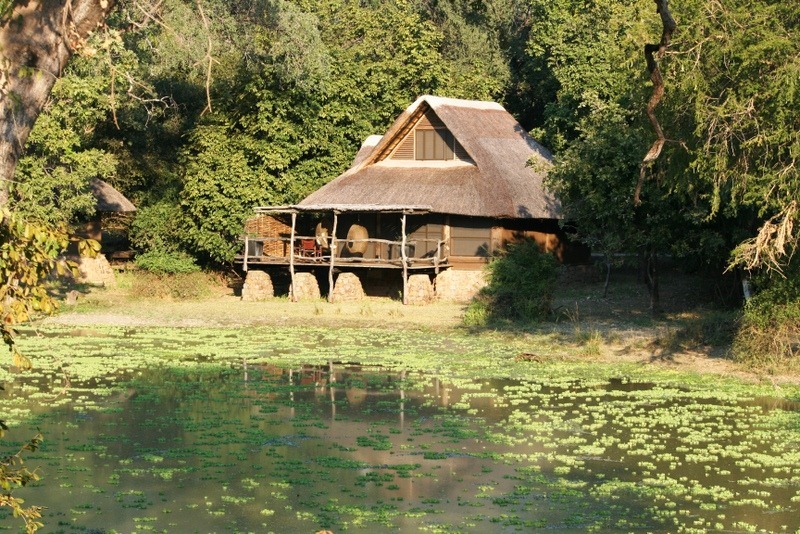 There are numerous less expensive lodges and bush camps in and around the park. 4. 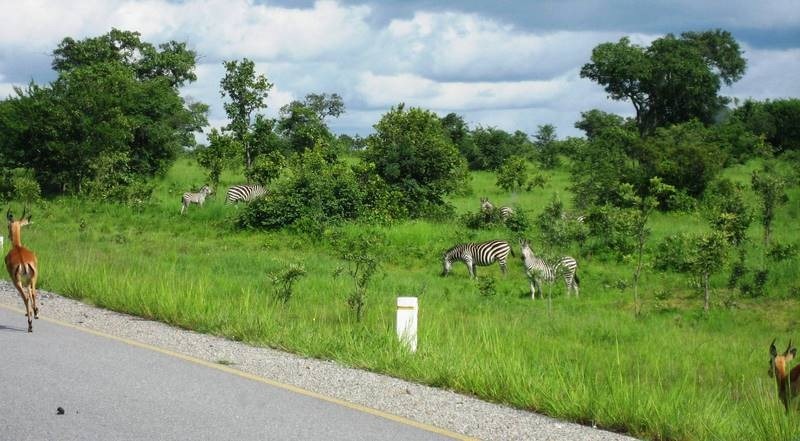 Northern Circuit: Zambia is keen to promote tourism in Northern Province on the Tanzanian border. 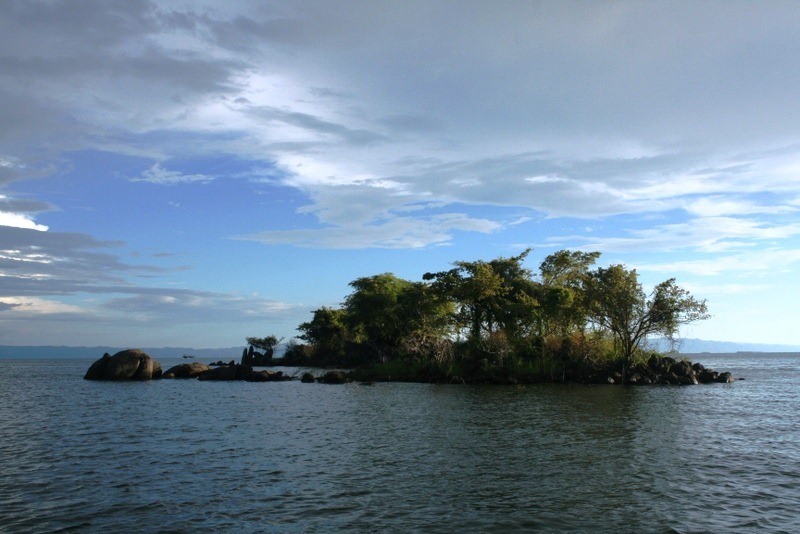 Kasaba Bay on Lake Tanganika, one of Africa’s Great Lakes, is currently under development as a major tourist destination. Once it’s completed sometime in the next decade, the area will boast several high-end resorts. 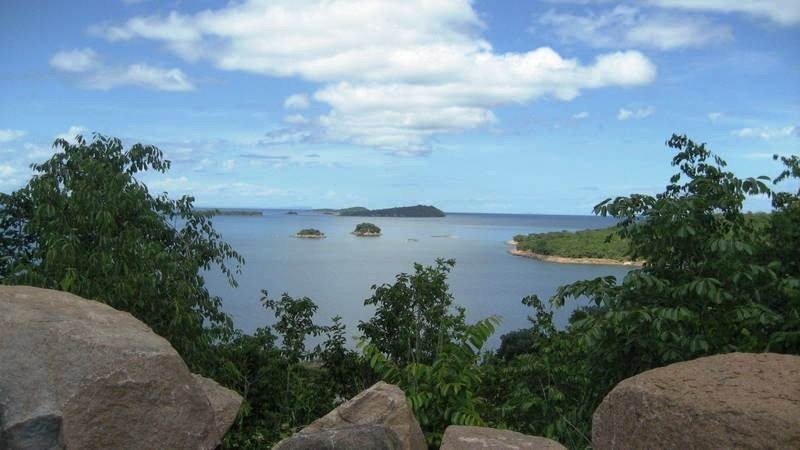 Fly to the Mbala airport near Kasaba Bay, or into the regional capital, Kasama. 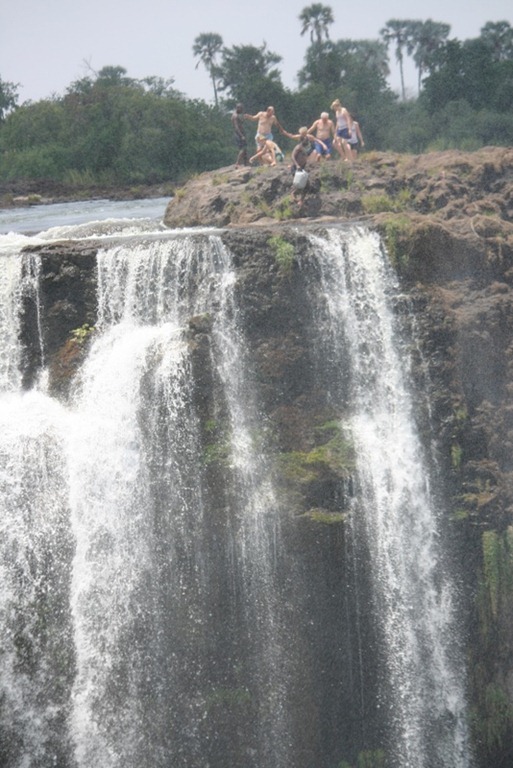 Hire a car and travel the back roads through beautiful country with subtropical forests, colorful villages, and spectacular waterfalls overshadowed by Victoria Falls such as Chishimba Falls. 5. 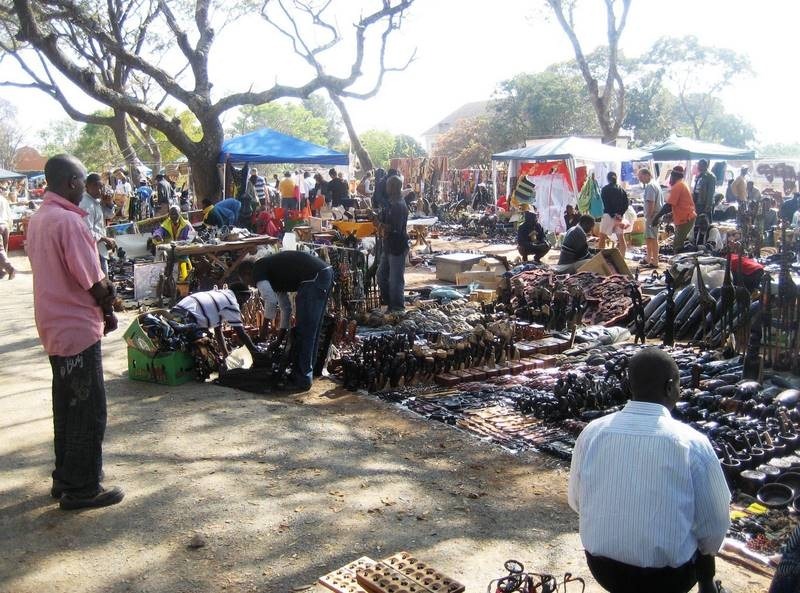 Saturday Dutch Market: Every last Saturday of the month, Zambia’s largest open-air market sets up shop at the Dutch Reformed Church in the Kabulonga area of Lusaka. 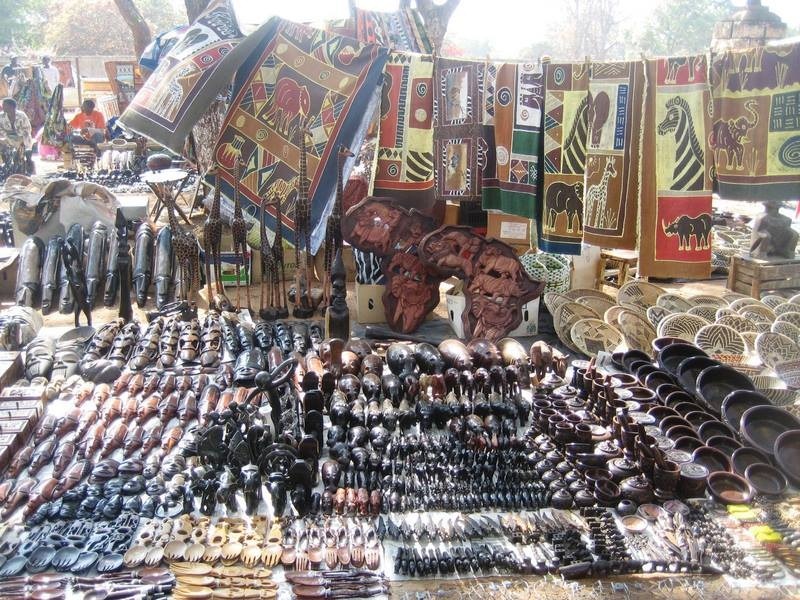 Artisans from Zambia and neighboring countries bring their arts and crafts to you. 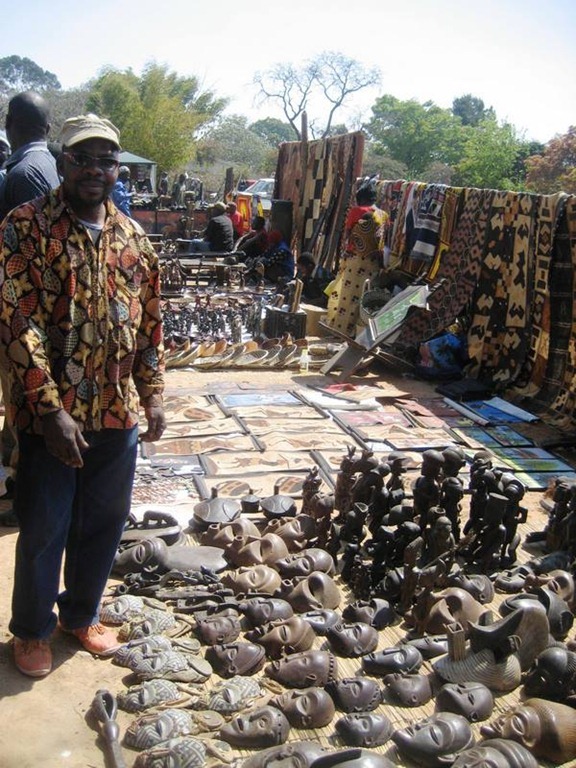 It’s one of the few places where you can find Zimbabwean soap stone sold next to Zambian copper plates. 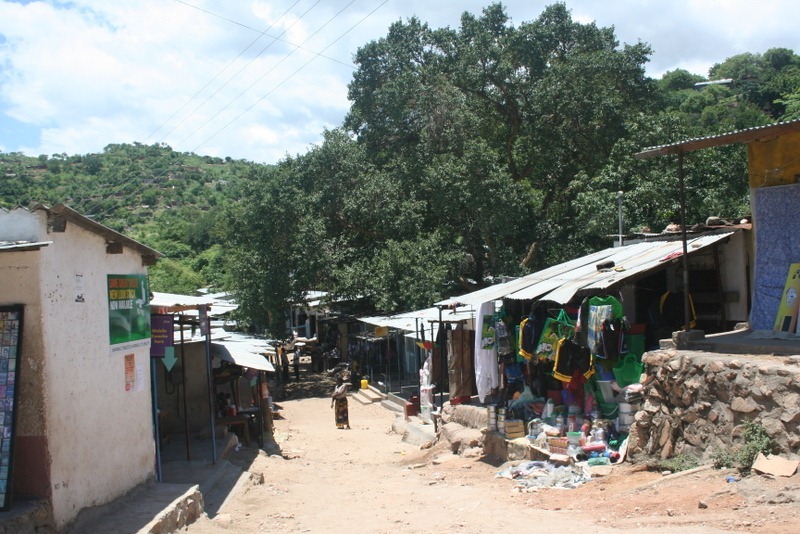 You can also taste a variety of ethnic dishes and buy produce. 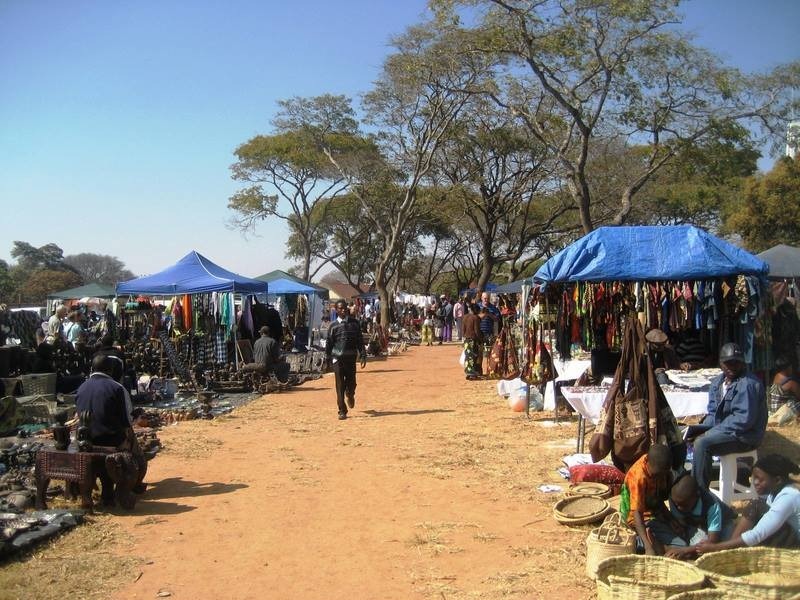 If you miss this market, try the smaller Sunday Market at the Arcades Shopping Centre in Lusaka that happens every week. 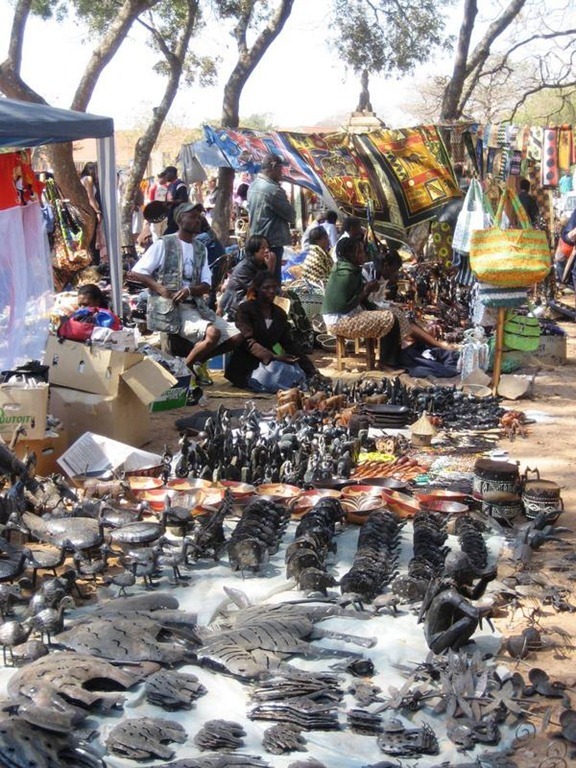 Be sure to bargain – the vendors will reduce prices below their original quotes and expect you to barter. 6. Lake Kariba: Spend a weekend on the world’s largest artificial lake, Lake Kariba, located in Southern Province on the Zimbabwean border. 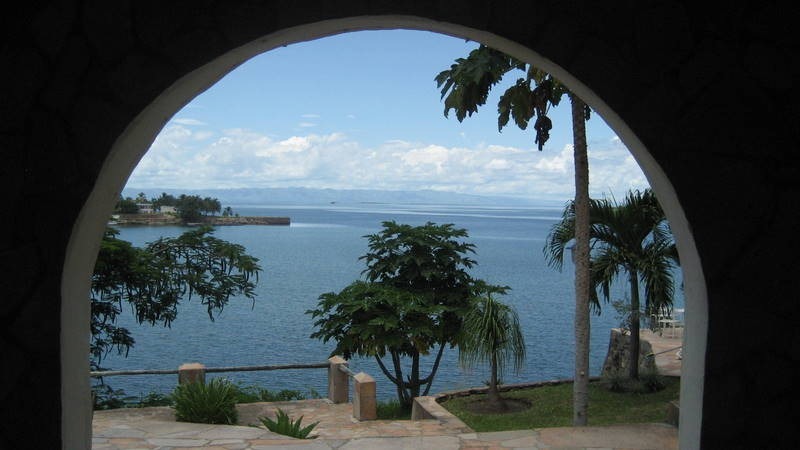 Stay in the town of Siavonga for a relaxing getaway. 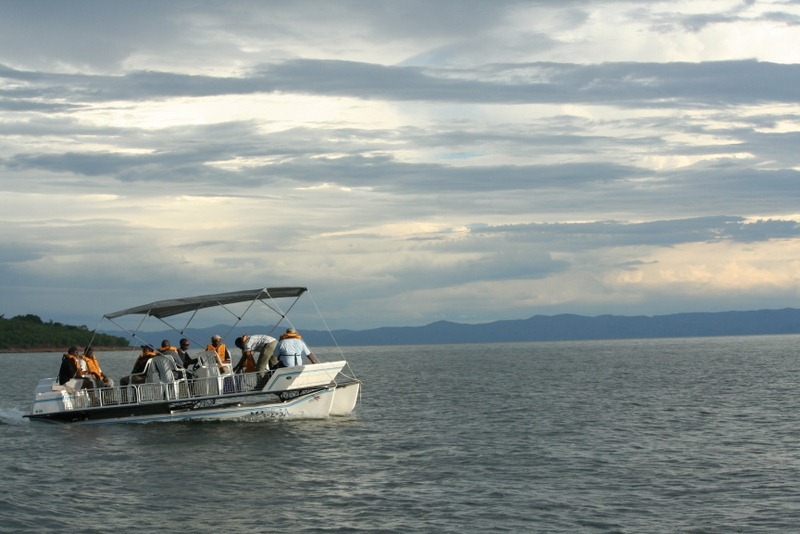 Take a boat cruise and visit Lake Kariba Dam. Dine on local crayfish. Click here for a detailed account of our trip to Lake Kariba in 2010. 7. 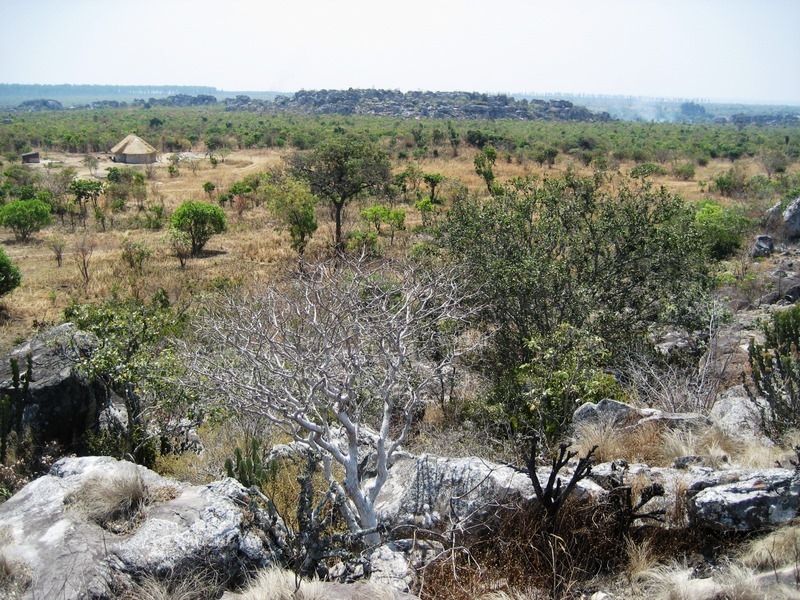 Western Province/Barotseland: Western Province, also called Barotseland, is a large and relatively remote province on the Angolan border. 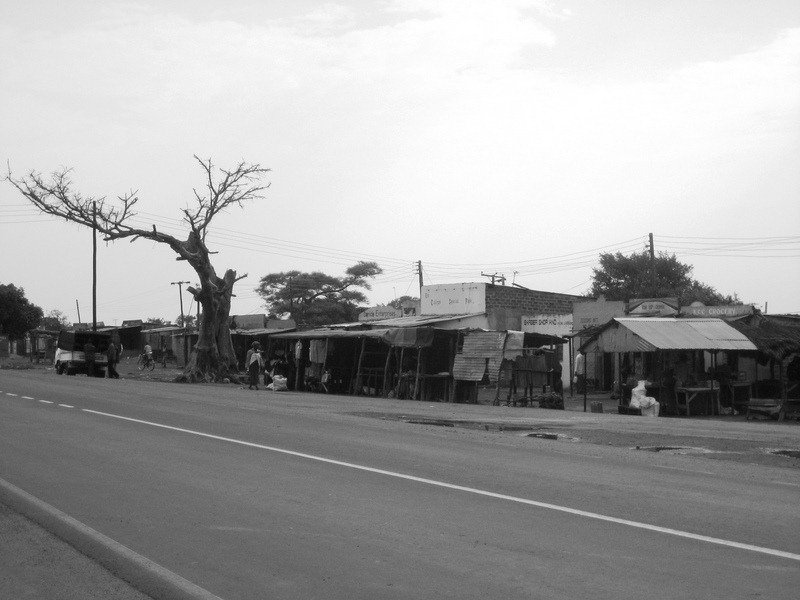 To get there, fly to the capital, Mongu, and hire a car, or self-drive. 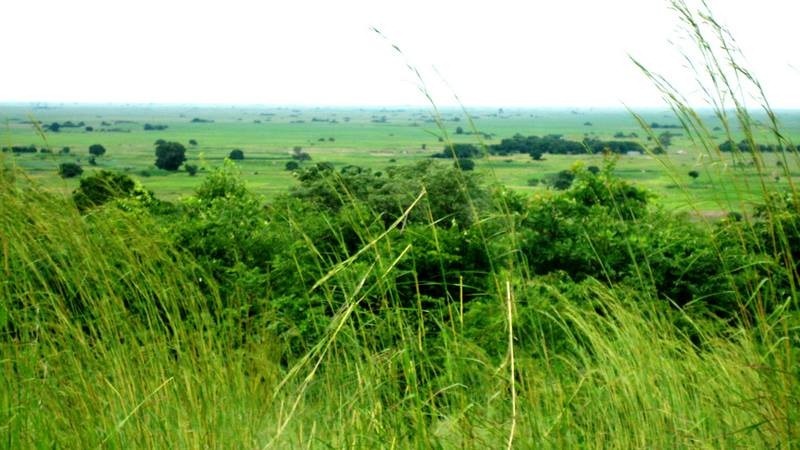 The province is home to Liuwa Plains National Park, the most isolated and least visited of all national parks in Zambia. 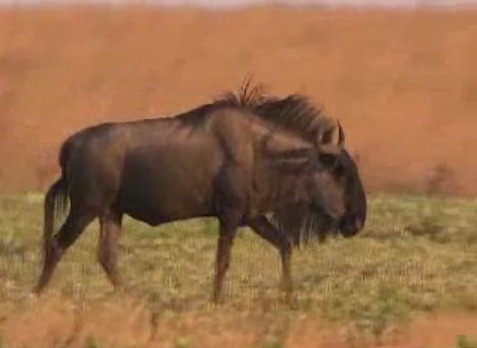 It’s worth a trip in November at the end of the dry season to see the world’s second largest wildebeest migration, when the herds turn south and head to Namibia. 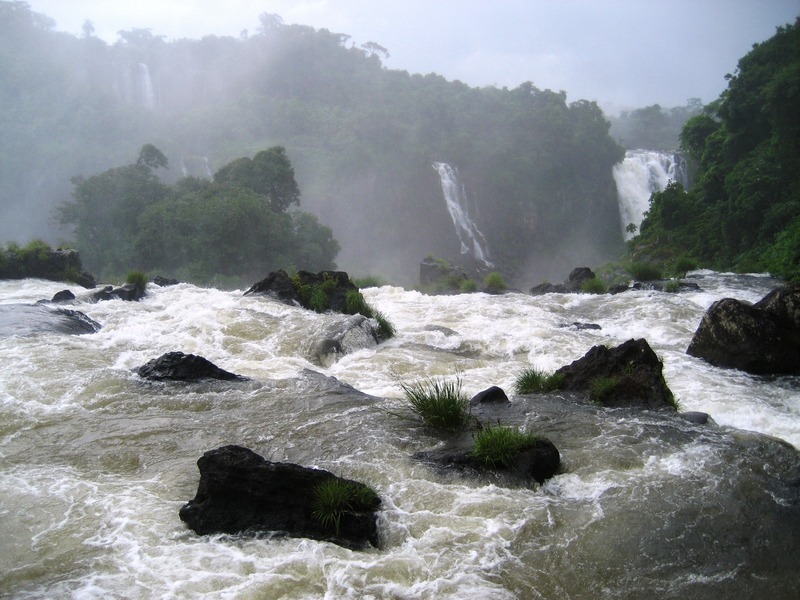 A word of caution — the park is very remote and impassible by land during the rainy season. 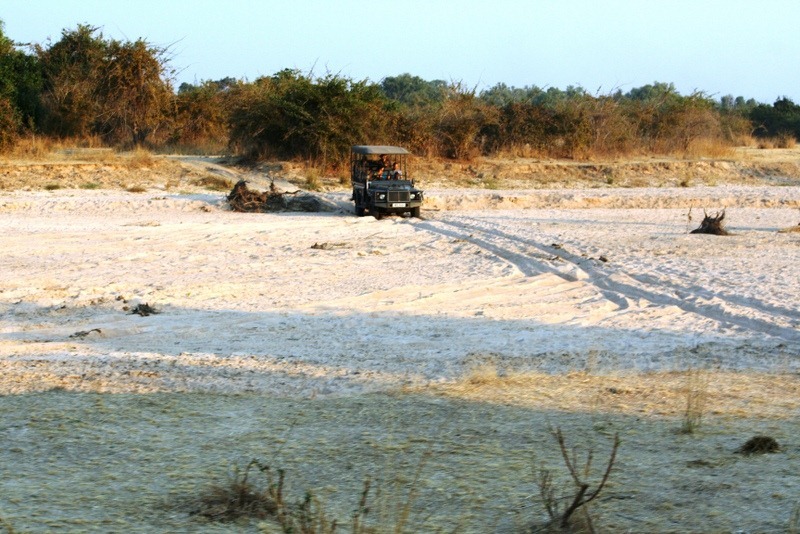 Even with a 4’x4′ vehicle, the roads are very sandy and difficult to navigate any time of the year. It’s better to visit with an experienced guide. 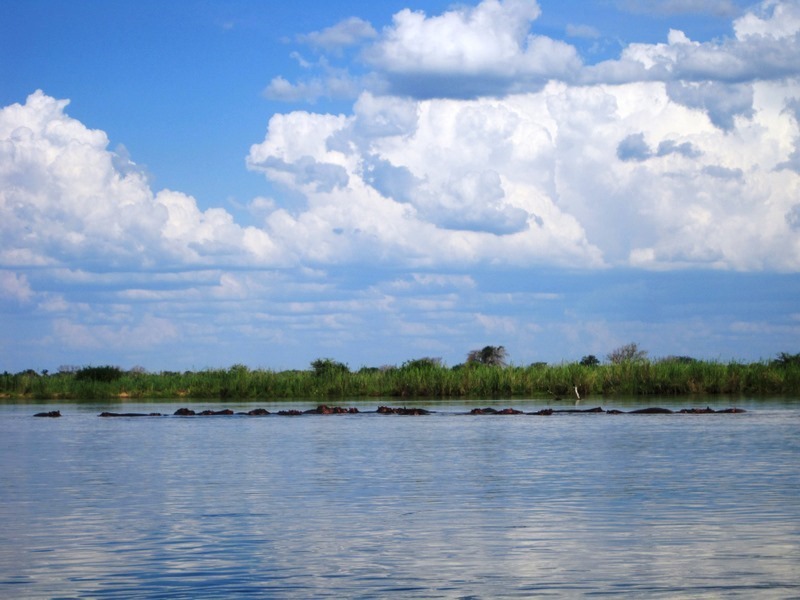 Western Province is also worth a visit in April to watch the Kuomboka Traditional Ceremony held each year by the Lozi tribe commemorating the end of the rainy season. The date varies with the end of the season. 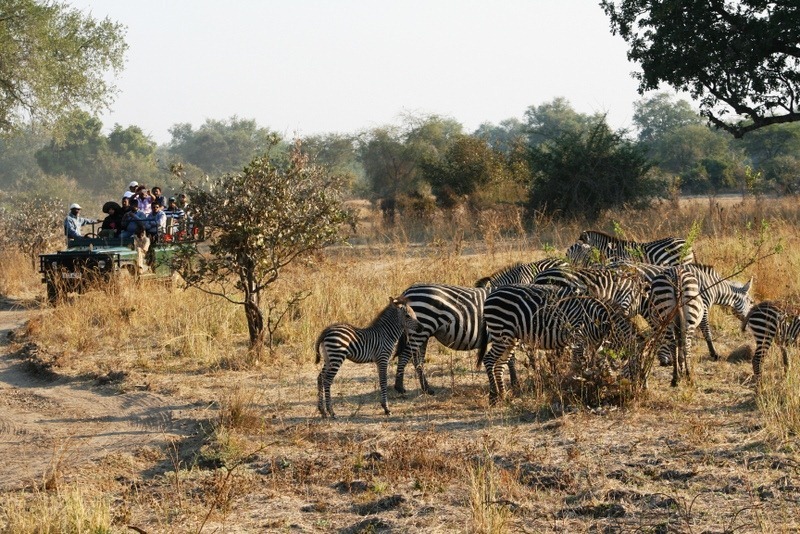 Held at the Barotse king’s palace in Limilunga, it is arguably the country’s most famous traditional ceremony and a great example of Zambian culture. 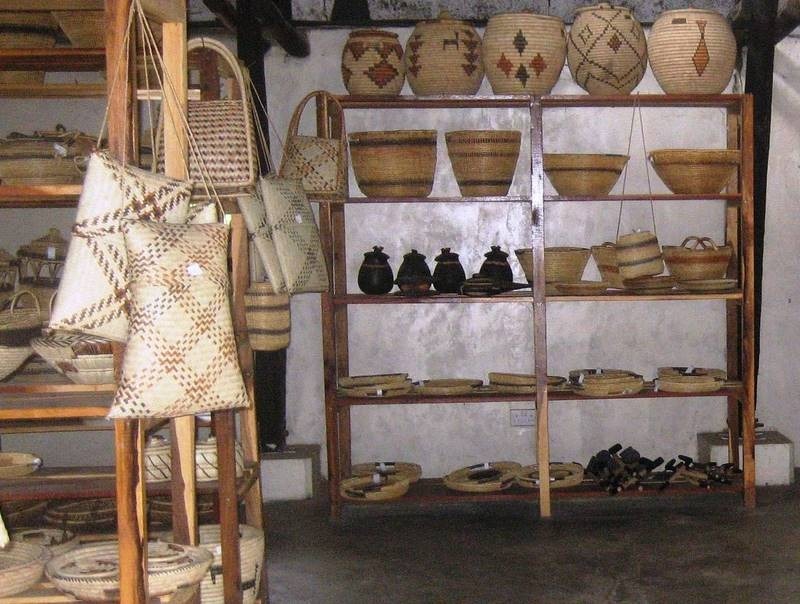 The gift shop at the Barotse Royal Museum sells local arts and crafts. 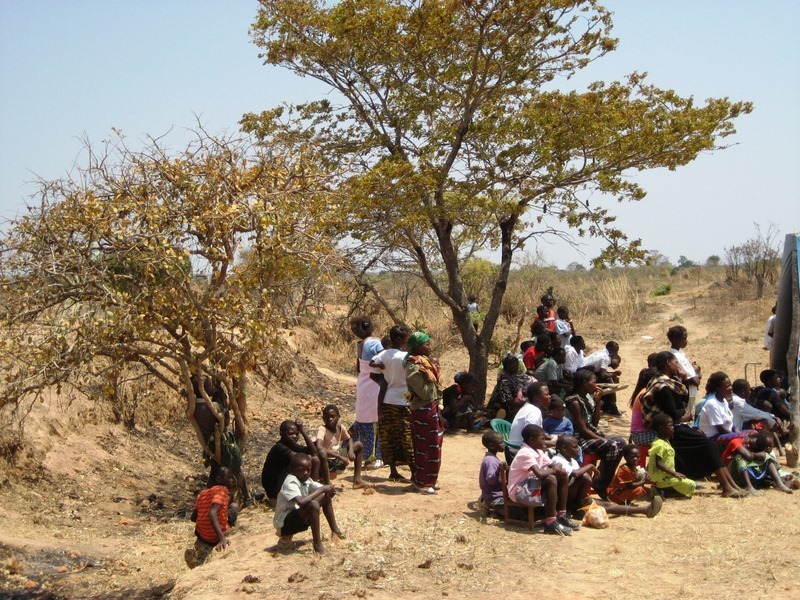 With recent political unrest in Western Province, ask ahead if you’re thinking about attending a ceremony, and avoid discussing Barotseland with locals. 8. 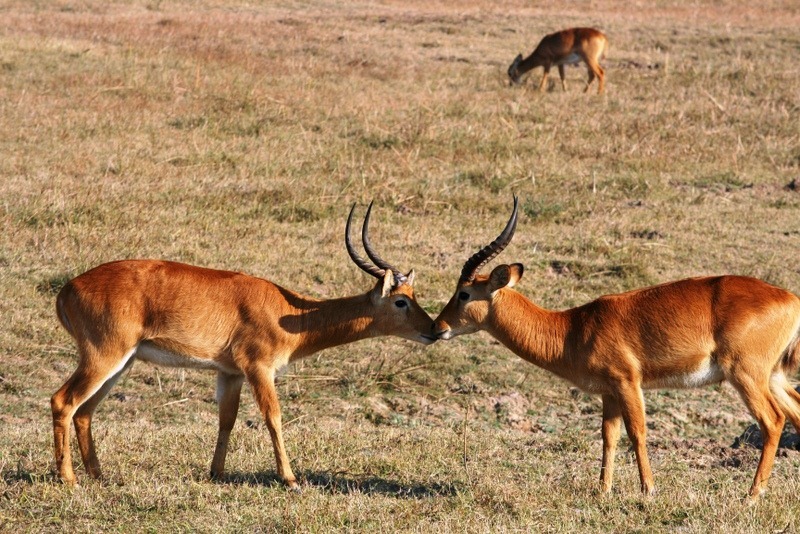 Kafue National Park: Although not as famous as South Luangwa National Park, Kafue National Park in Central Province is a good weekend getaway from Lusaka. 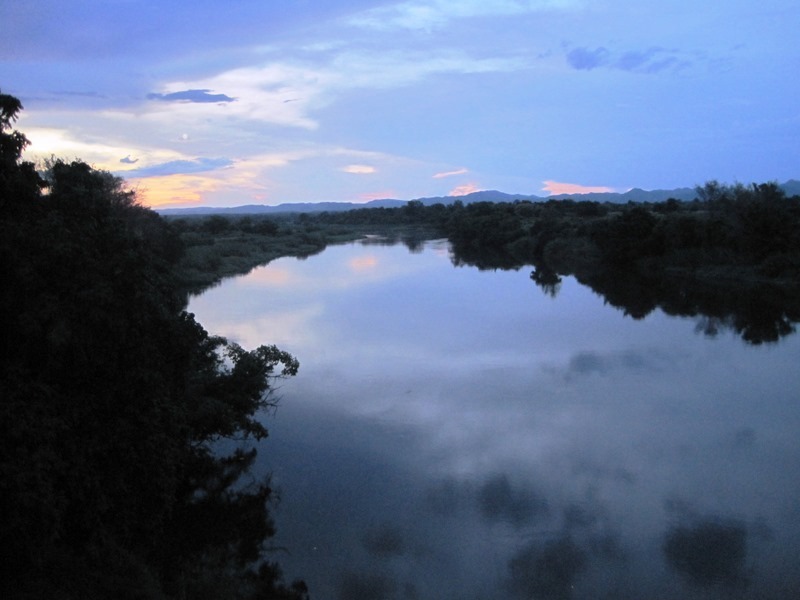 It’s Zambia’s oldest and largest national park. 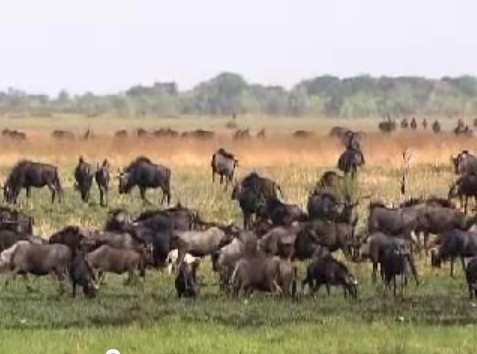 Although it suffered for years from game poaching, the animal population has recently rebounded. 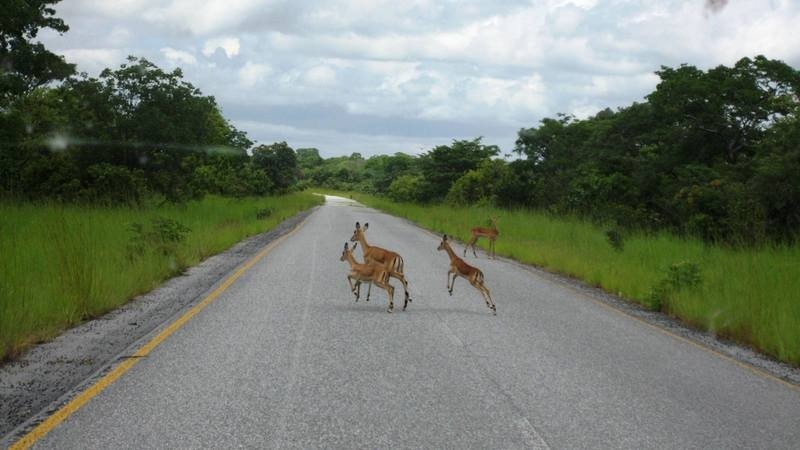 It’s an easy three-hour drive west of Lusaka, and after a paved road is built, north from Livingstone. 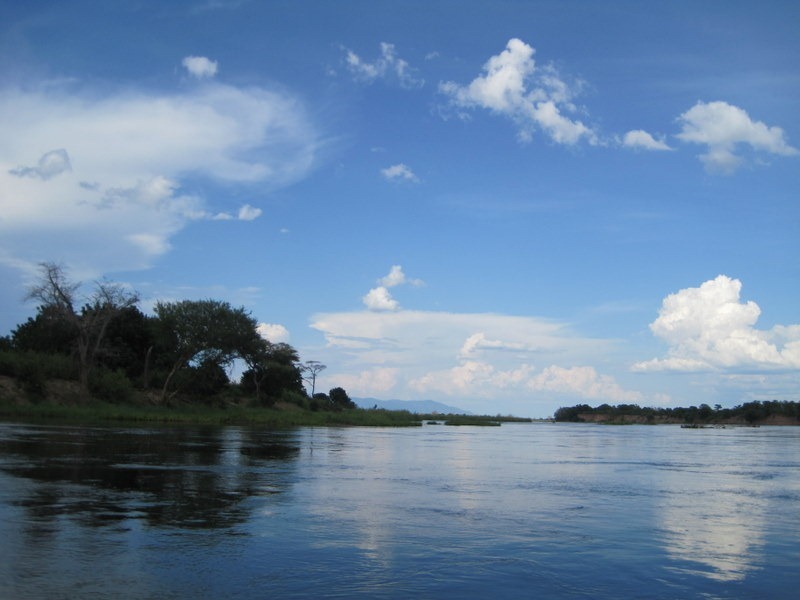 Stay at Mukambi Lodge, which is easily accessible from the highway, or at one of several lodges that follow the Kafue River south to the Itezhi-Tezhi Dam. 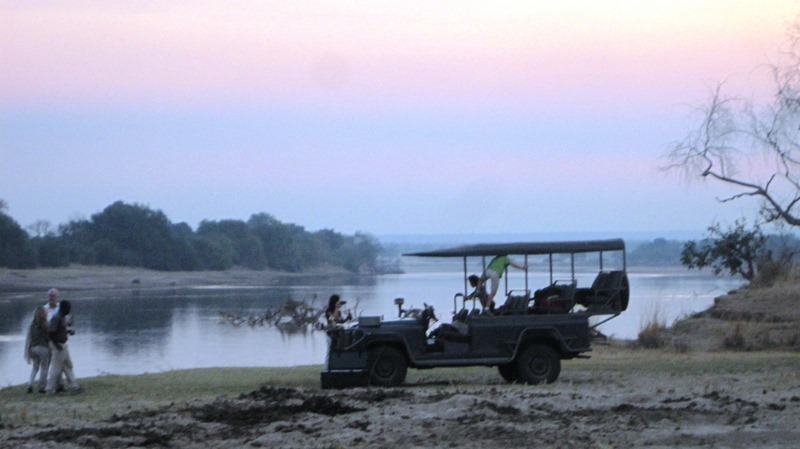 Go with an experienced guide if you plan to venture off the beaten path. 9. 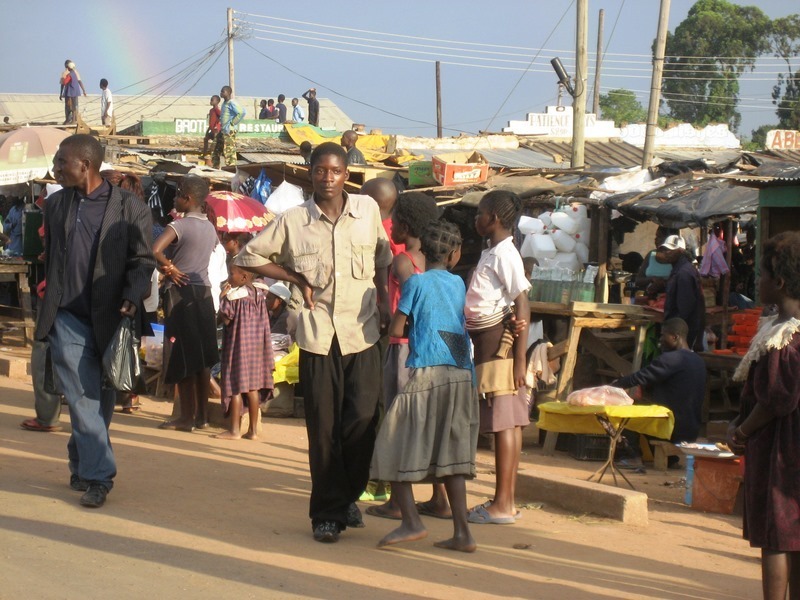 Visit a compound: Most urban Zambians live in neighborhoods known as “compounds.” Ask a local whom you trust to take you in the daytime to one of the safer compounds. Try drinking Shake-Shake chibuku (fermented corn meal) at a local pub. 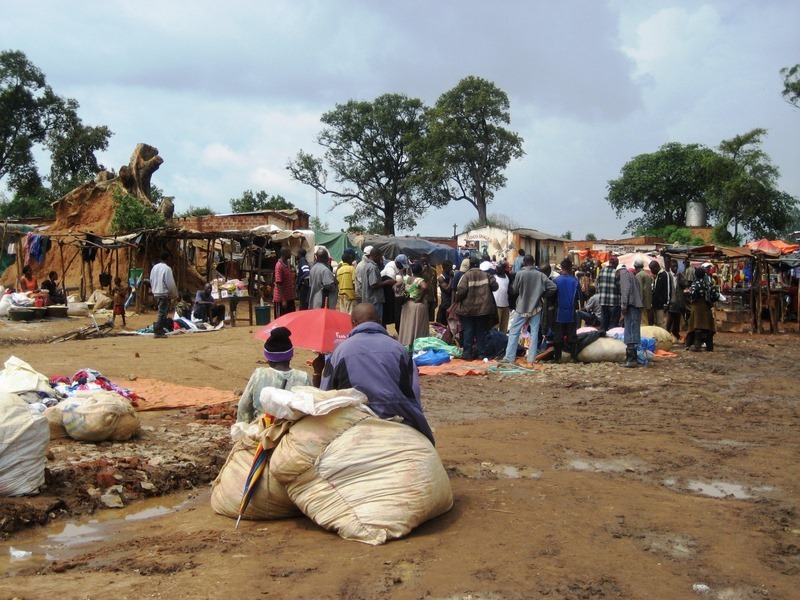 Two of the largest and safer compounds in Lusaka are the Bauleni and Kalingalinga compounds. 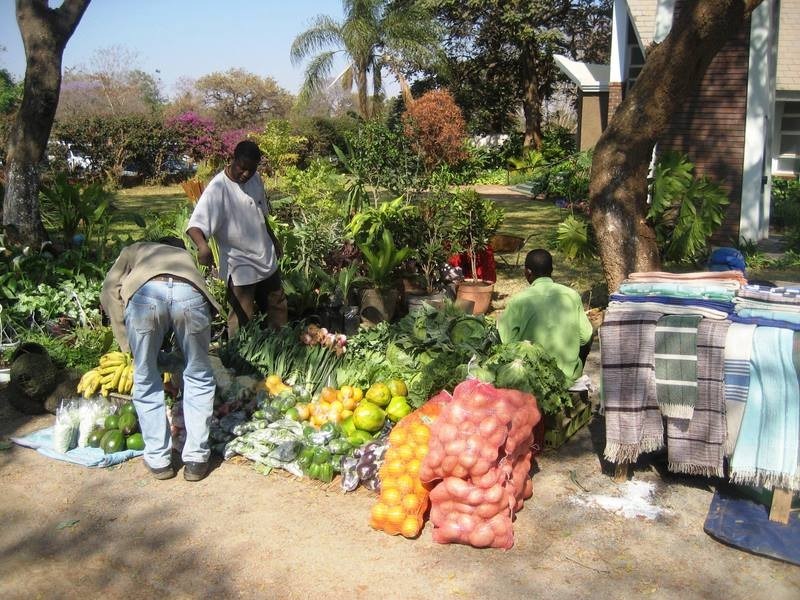 Walk around the compound and savor the unique flavor of everyday Zambian life. Meet new friends who will be curious why you’re visiting. Leave your valuables at home to avoid petty theft. 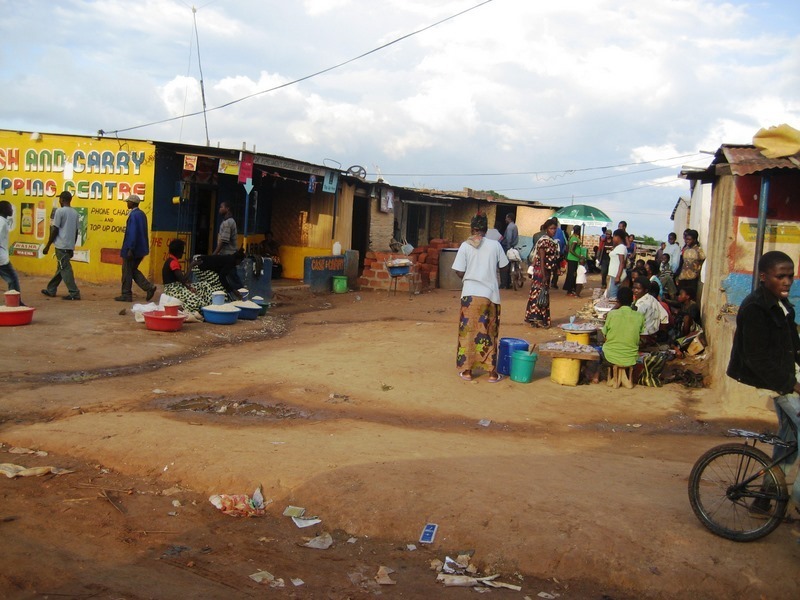 Below: Kipushi, a town on the Zambian-DR Congo border. 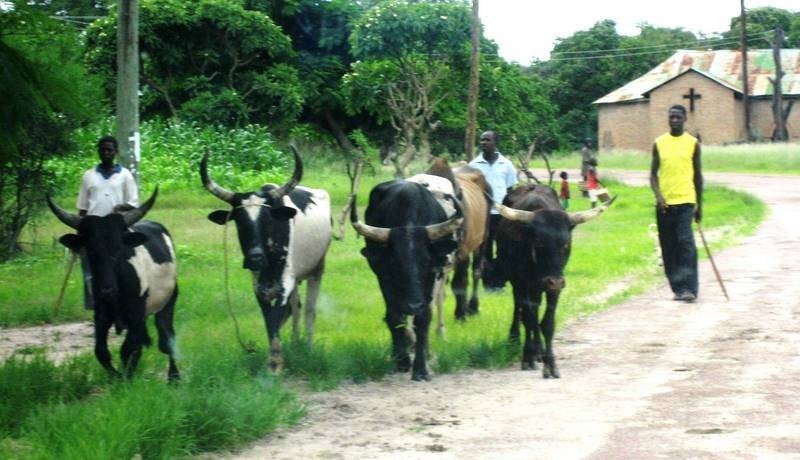 The following photos were taken in compounds around Lusaka and Solwezi, the capital of North-Western Province. 10. 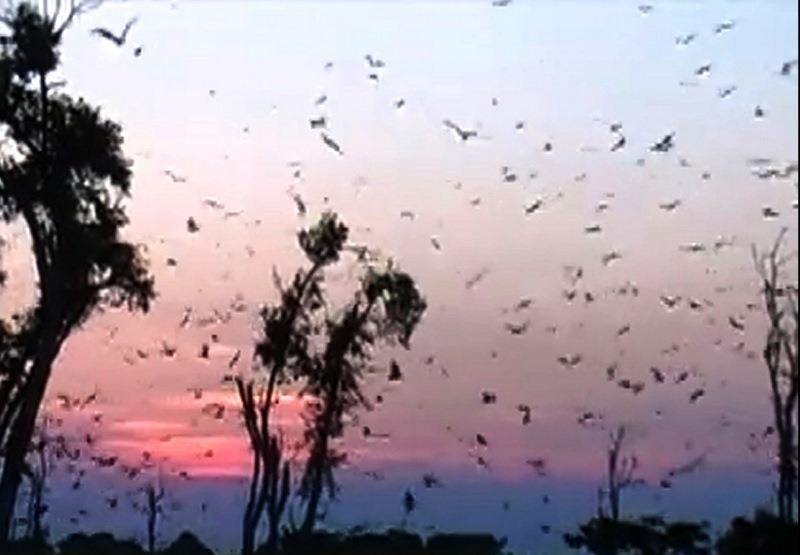 Kasanka Bat Migration: Each October, the world’s largest migration of giant fruit bats happens at Kasanka National Park in Northern Province. 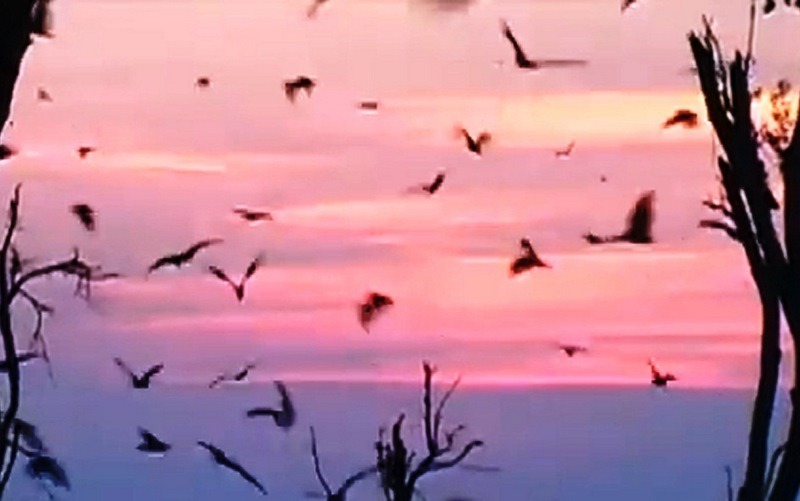 You’ll go batty with excitement or fear from the approximately eight million fruit bats that swarm harmlessly above you in a beautifully orchestrated dance. 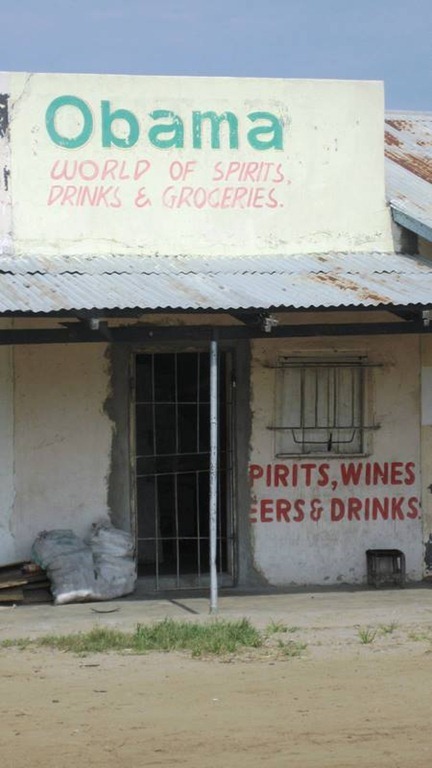 I couldn’t list everything you can do when you visit Zambia. 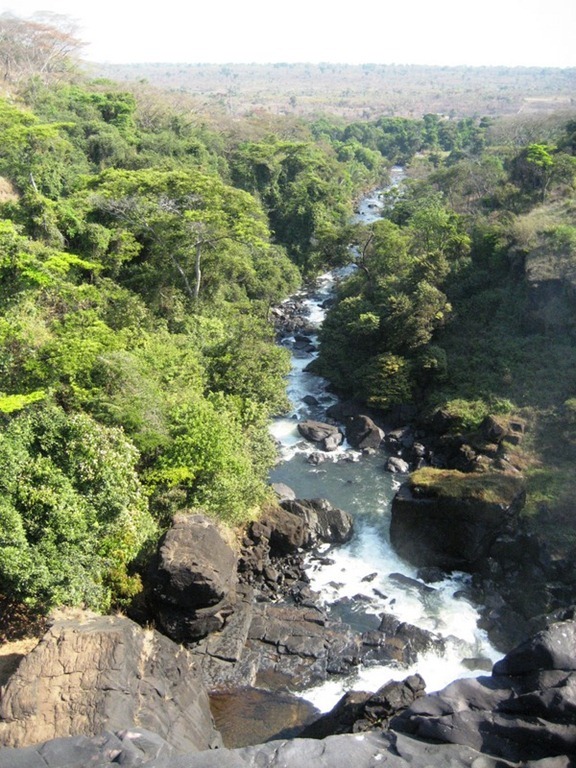 Some honorable mentions include the Source of the Zambezi River, a place of special significance to the Zambian people, in the remote Mwinilunga district of North-Western Province; Shiwa N’gandu in Northern Province; the mines of Copperbelt Province; Lake Bangweulu in Luapula Province; and the Livingstone Memorial in Itala where David Livingstone’s heart (yes, his heart) was buried under an Mvula tree. 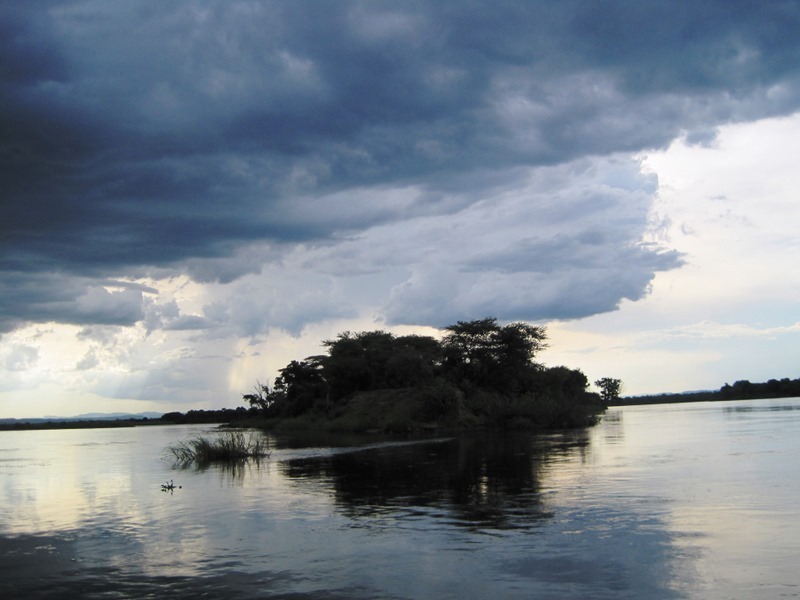 The Zambian climate fluctuates between the dry season (July-November) and the rainy season (December-May). 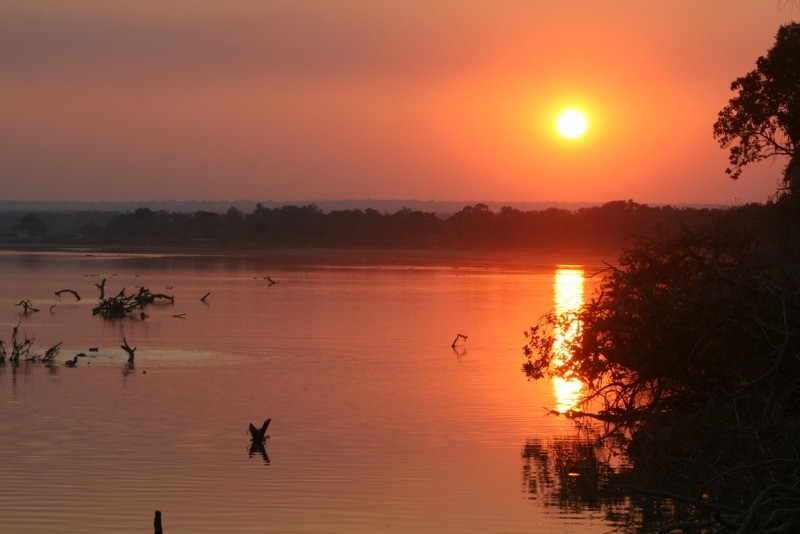 Although the best times to visit are in May and November, Zambia is always beautiful and welcomes you with open arms. Note: This is an updated version of a blog entry originally posted in April 2011. M.G. Edwards is a writer of books and stories in the mystery, thriller and science fiction-fantasy genres. 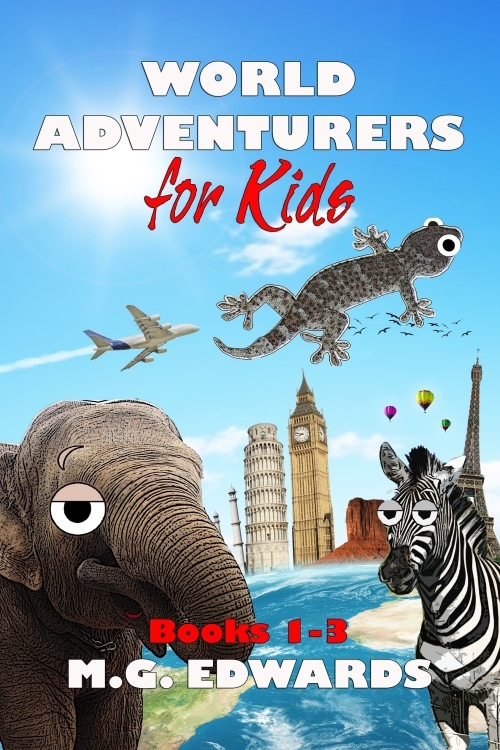 He also writes travel adventures. He is author of a collection of short stories called Real Dreams: Thirty Years of Short Stories available as an ebook and in print on Amazon.com. His next book, Kilimanjaro: One Man’s Quest to Go Over the Hill, will be released on March 31, 2012. 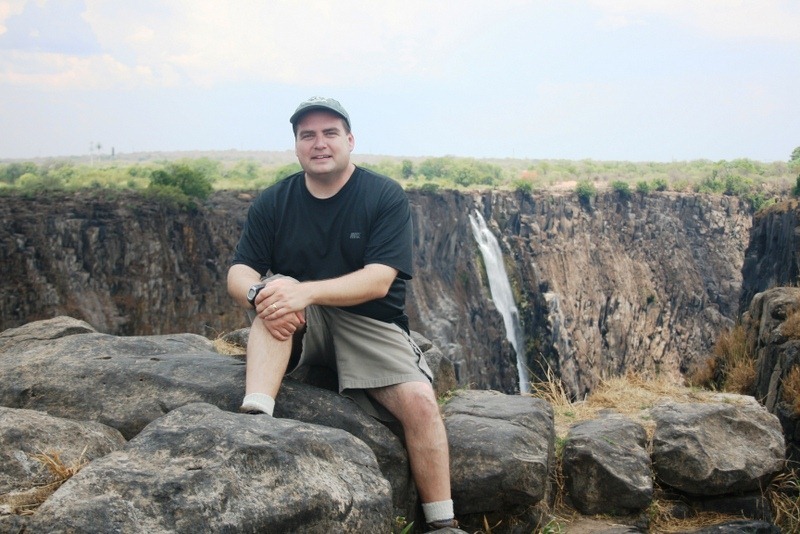 He lived in Lusaka, Zambia during 2009-11 and now lives in Bangkok, Thailand with his wife Jing and son Alex. 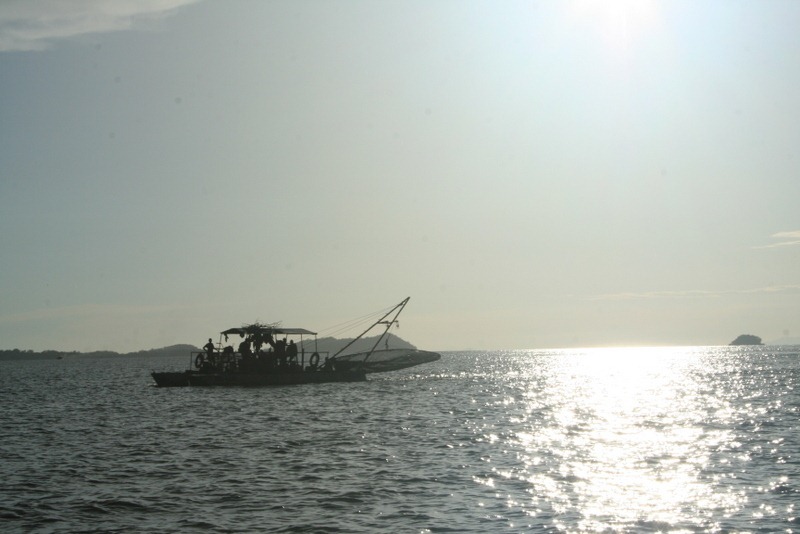 My wife and I went on a short weekend getaway to Lake Kariba in February 2011. What an amazing not-so-hidden gem. 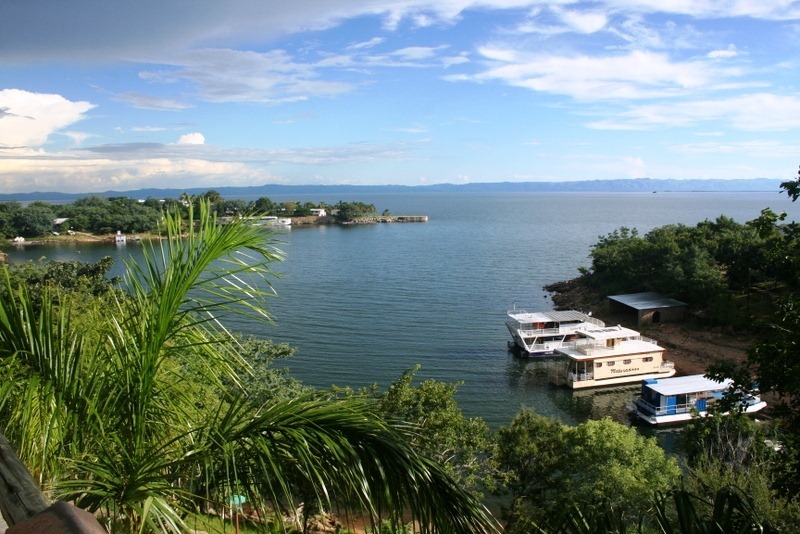 Few people have heard of this body of water that happens to be the world’s largest artificial lake and reservoir. 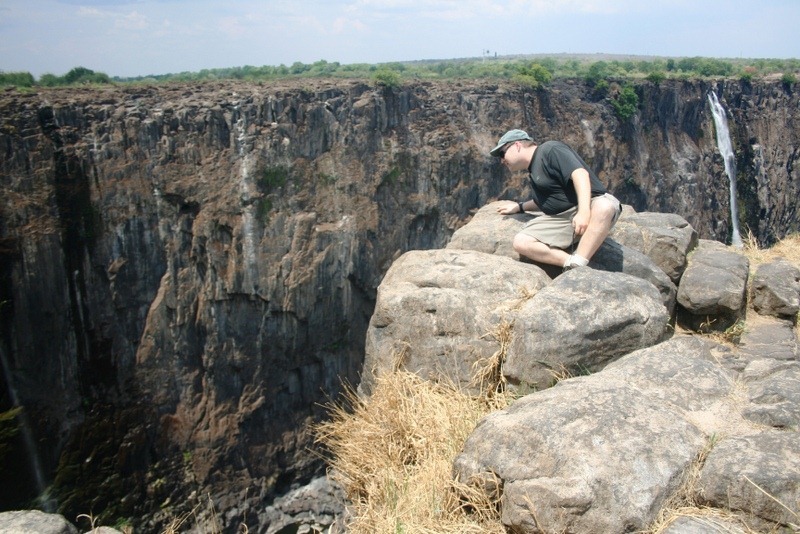 Straddling the Zambian-Zimbabwean border, it was created in 1958 during the construction of the Kariba Dam when it was near completion, and engineers sealed the dam and flooded what had once been a large valley in the Zambezi River Basin. 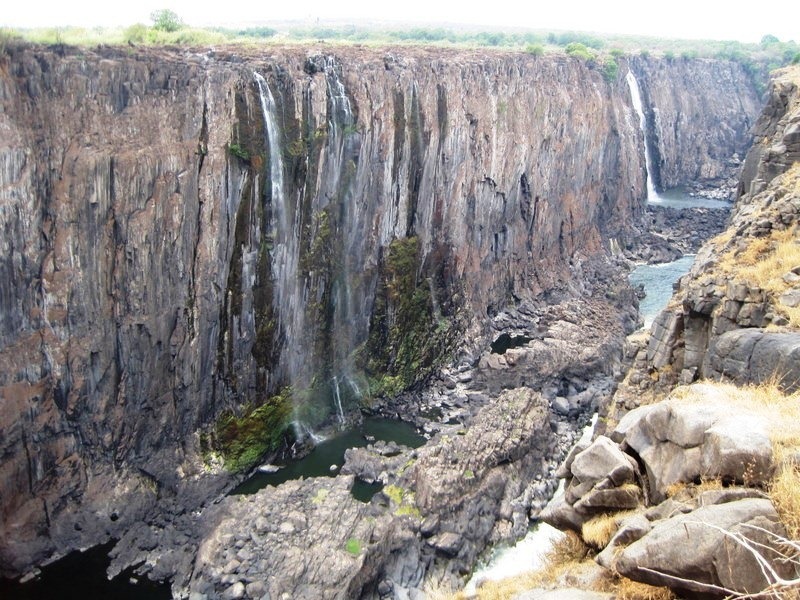 Lake Kariba is overshadowed in Zambia and Zimbabwe by nearby Victoria Falls, arguably the world’s largest waterfalls, as well as by game parks and private reserves scattered throughout the region. 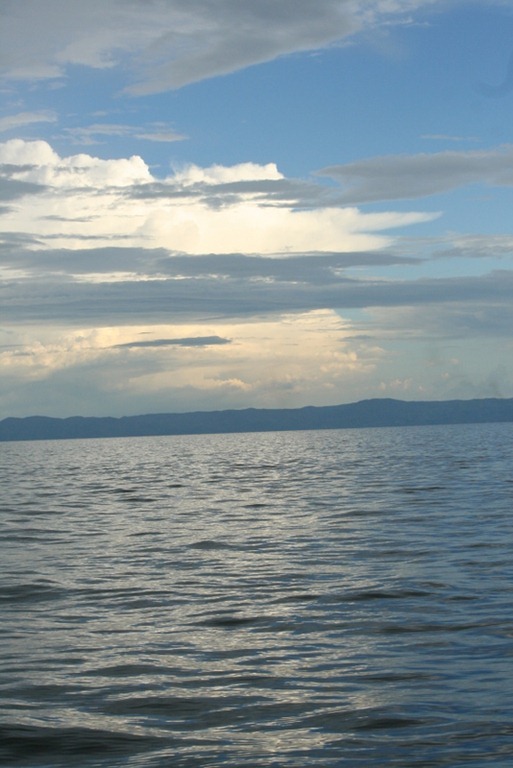 I think that Lake Kariba holds its own as a tourist destination, and I recommend a visit to anyone planning a trip to see the falls. 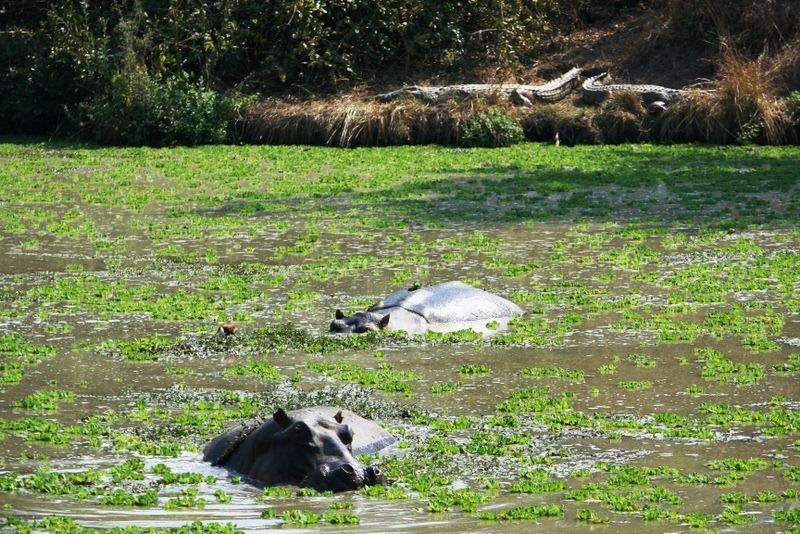 Hippopotamuses, crocodiles, baboons, freshwater fish, and several bird species call the lake home, although they make fewer appearances than one would expect for such a large body of water. 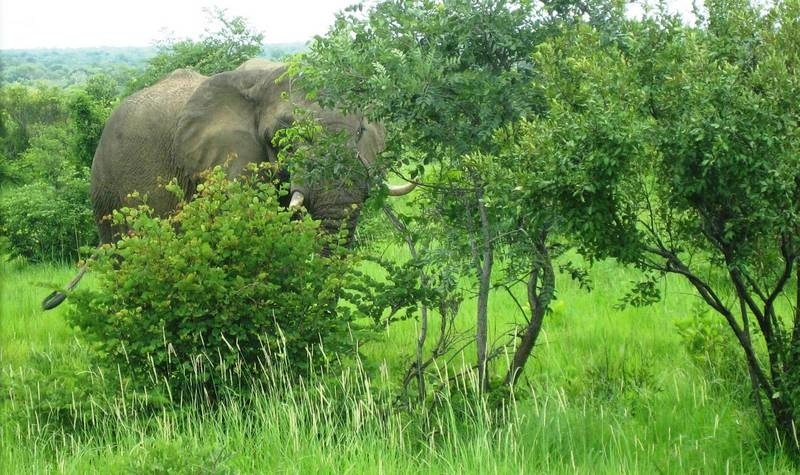 The wildlife that attracts gawking tourists is concentrated further east in the game parks of the lower Zambezi River Basin. Nevertheless, the lake does not lack for vegetation and scenic beauty. 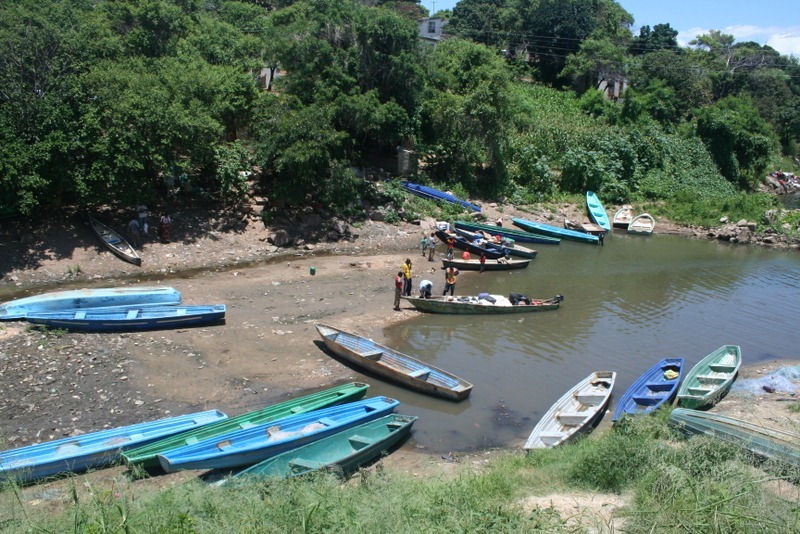 Whenever the lake comes up as a potential travel destination, locals tend to respond “don’t swim in the water!” because it is a breeding ground for bilharzia, or schistosomiasis, a snail-borne parasitic disease, and crocodiles. 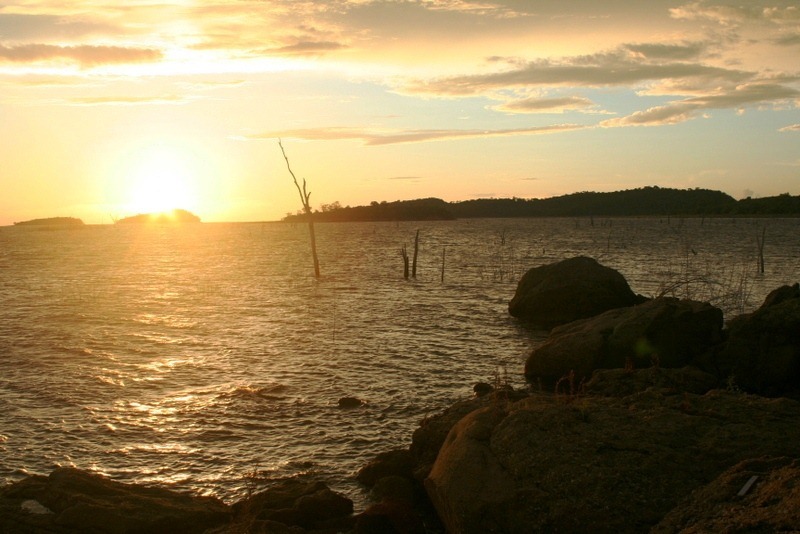 Avoiding the water notwithstanding, Lake Kariba is well worth a visit, especially if you want to enjoy a quick getaway to a place with scenic views and a relatively safe natural environment. While the area offers few children’s activities, families can still enjoy what it has to offer. Don’t forget to pack some books or games for the kids to alleviate boredom. 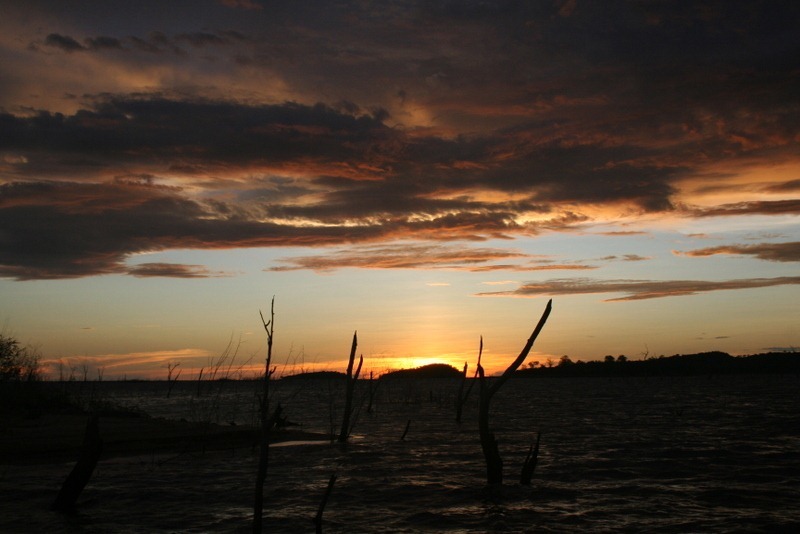 The weather varies during the rainy season, so it’s important to check the weather conditions before visiting the lake. 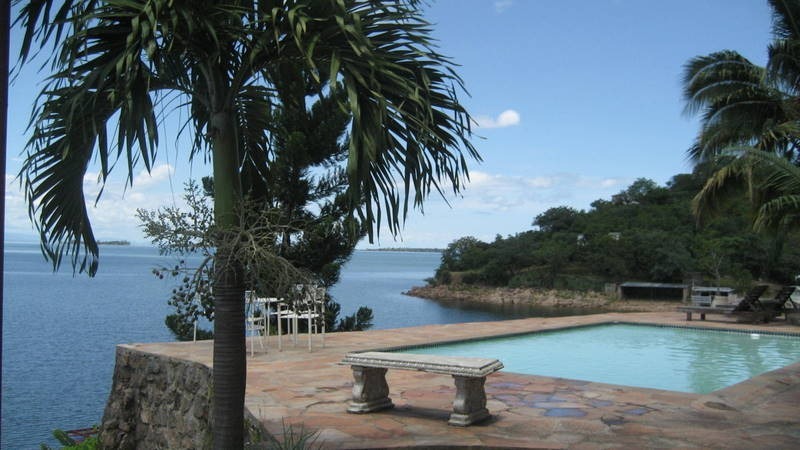 We stayed at the aging Lake Kariba Inns, one of the nicer resorts in the town of Siavonga, Zambia that passed as a three-star hotel. 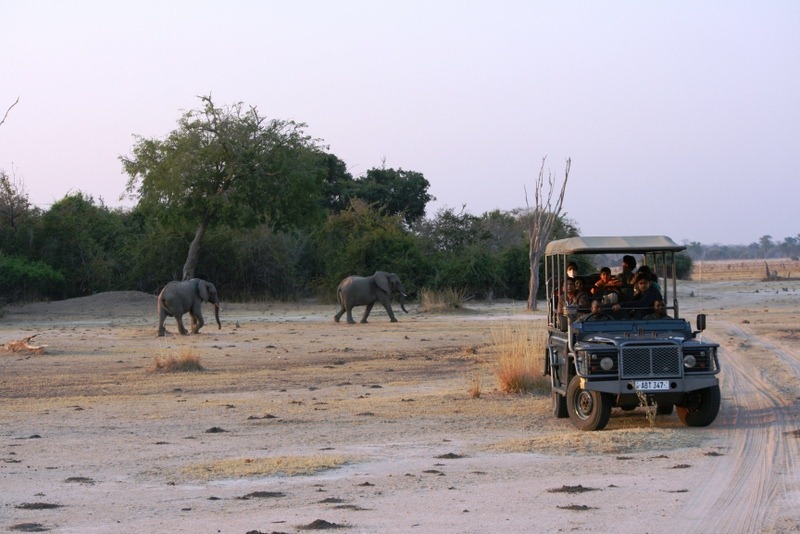 At just over US$100 per night during the off-season in 2011, the price was reasonable compared to some overpriced Zambian safari lodges that charged upwards of $400 per night. The room was clean and comfortable, although like many rural lodges, it was still infested with its fair share of unwanted critters. The ants carried off any food in sight, so we had to keep it sealed. The villas with lakefront verandas had gorgeous views of the lake. I deluded myself into thinking that I was on the Mediterranean when I lounged on the veranda, an illusion that lasted as long as it took for the fishermen plying on crayfish and fish to pass by in their large trawlers. The resort’s amenities included a large gym and a poolside bar with a pool table and Ping-Pong table. The waterfront restaurant served decent food with a decidedly Indian flavor; the curry and yogurt dishes were tasty. We were disappointed that the inn had run out of crayfish, a local specialty. 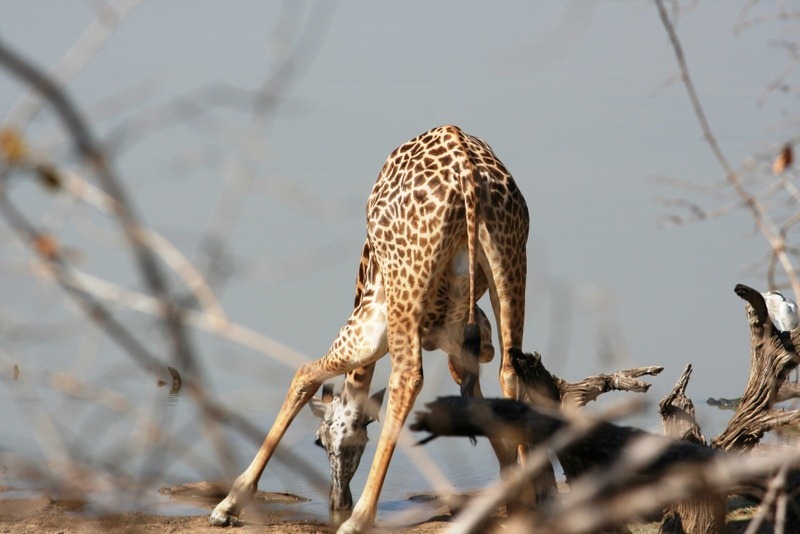 Lake Kariba Inns’ Achilles’ heel was its average customer service. Some staff members were helpful; some were not. 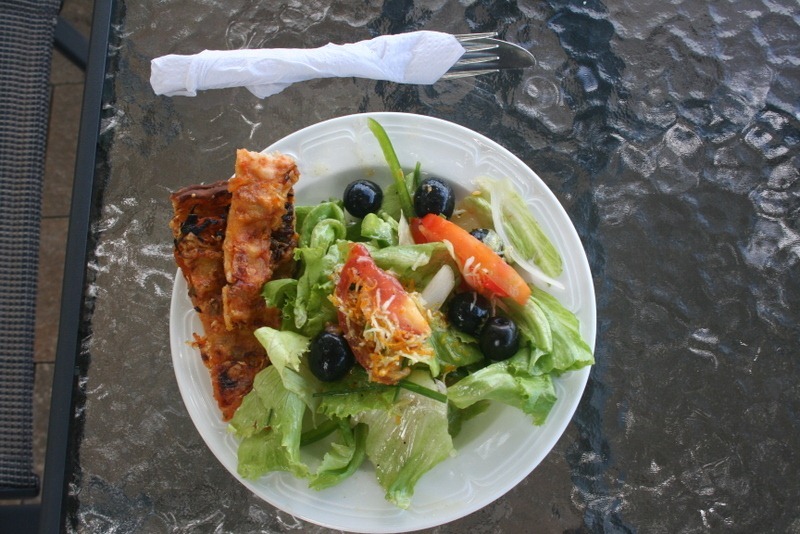 Whenever the buffet was served in the restaurant, it was virtually impossible to order room service. 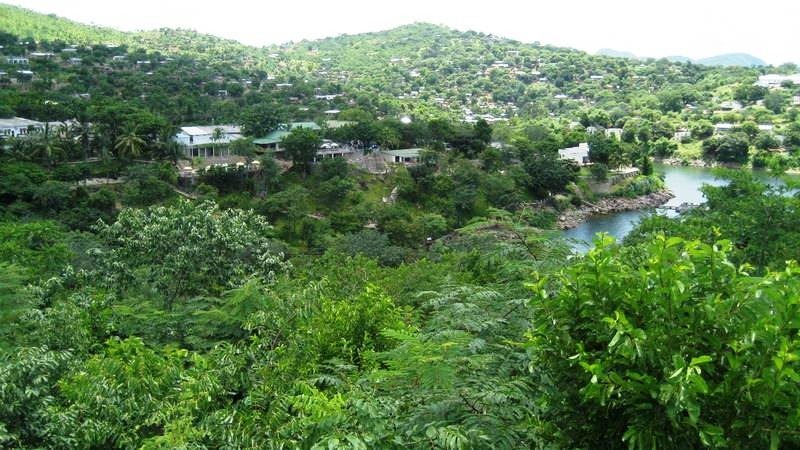 Lake Kariba Inns sits atop one of the promontories overlooking Siavonga with its own harbor with boats ready to take guests on an affordable, two-hour lake cruise to the top of the Kariba Dam and lake islands. The lake cruise was well worth the money. It left in the late afternoon not long before sundown. 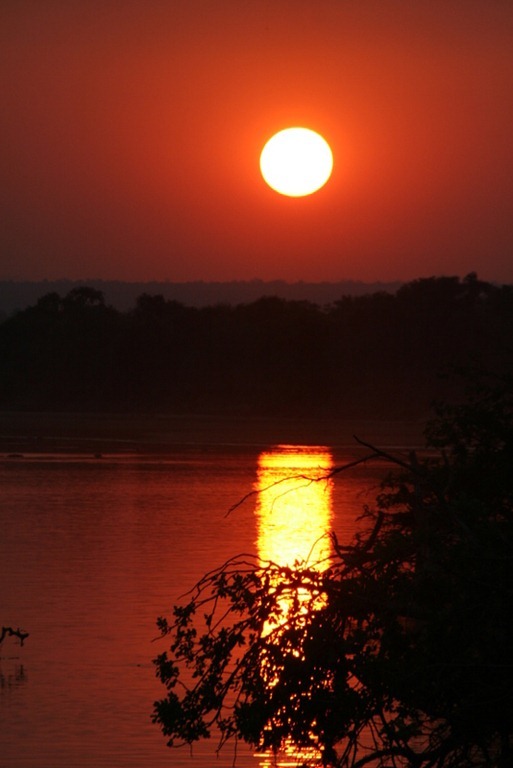 My wife and I basked in the glow of an African sunset from Sampa Karuma Island, a deserted island on the Zimbabwean side of the lake (no visa needed). Although the weather was calm for most of the cruise, the waves kicked up after sunset, and we held on as the boat rocked its way back to shore. 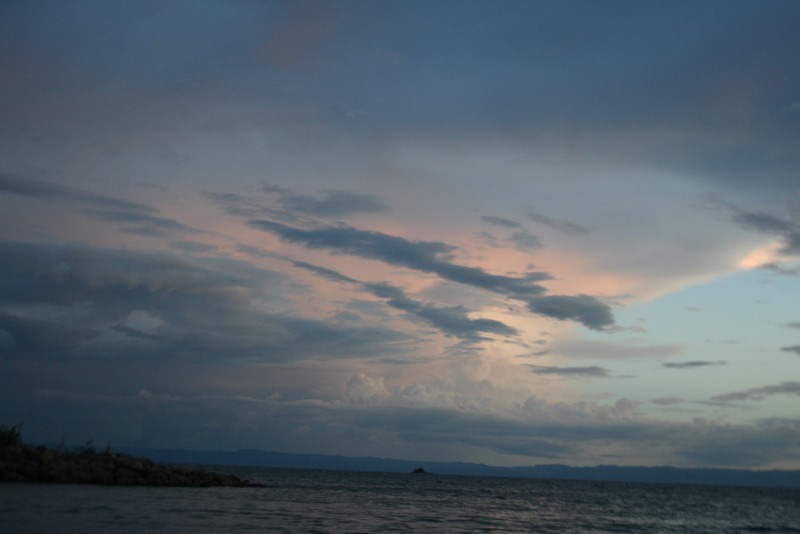 Many lodges are located in and around Siavonga. 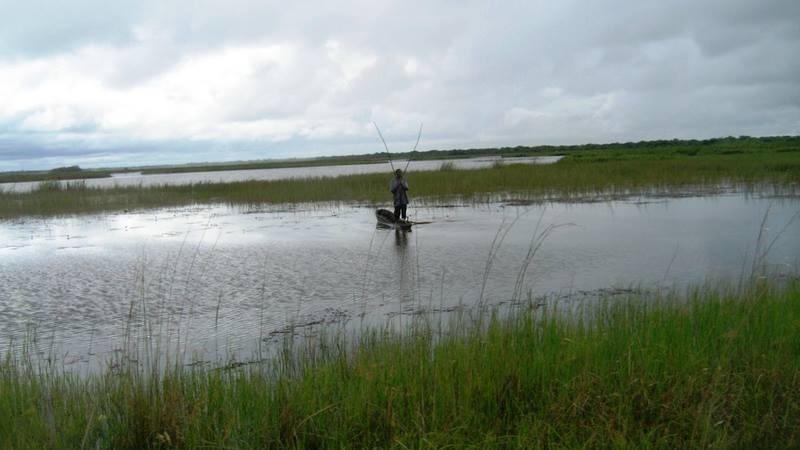 Lake Safari Lodge, Eagle’s Rest, and Sandy Beach are other popular lodging options. 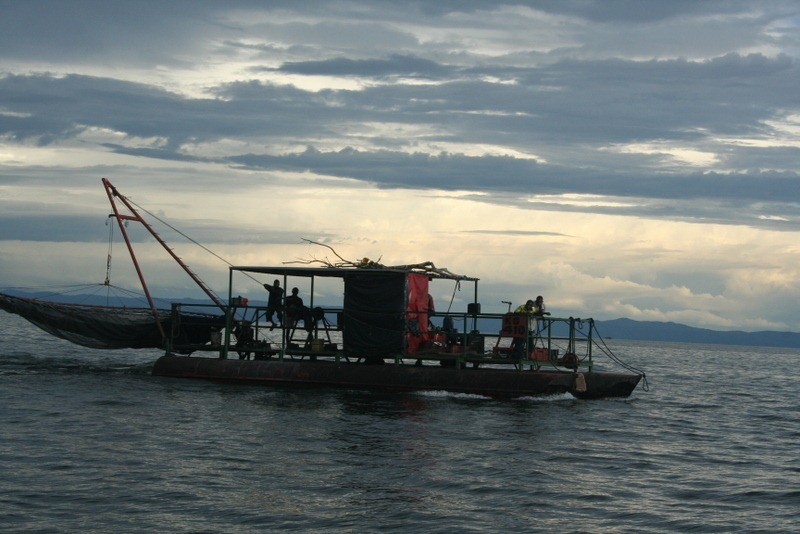 Although we did not visit any of them, we were under impression that they were comparable to Lake Kariba Inns. 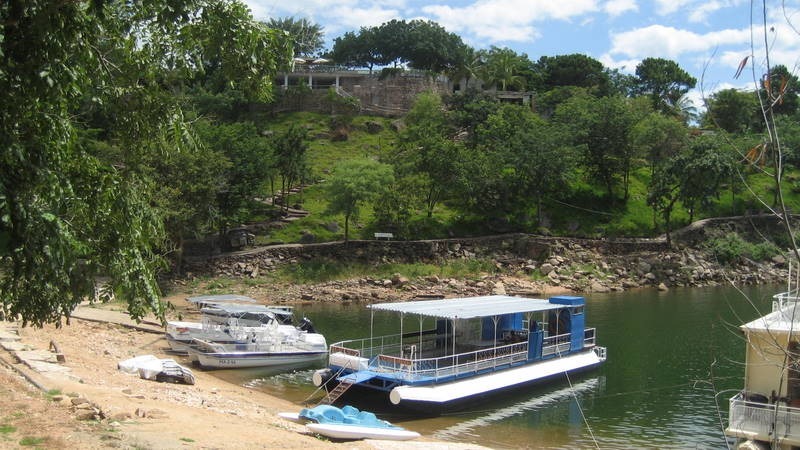 For those who want to experience the lake up close and personal, Protea Hotels launched in 2011 the Southern Belle Hotel, a former steamboat converted into a floating resort. 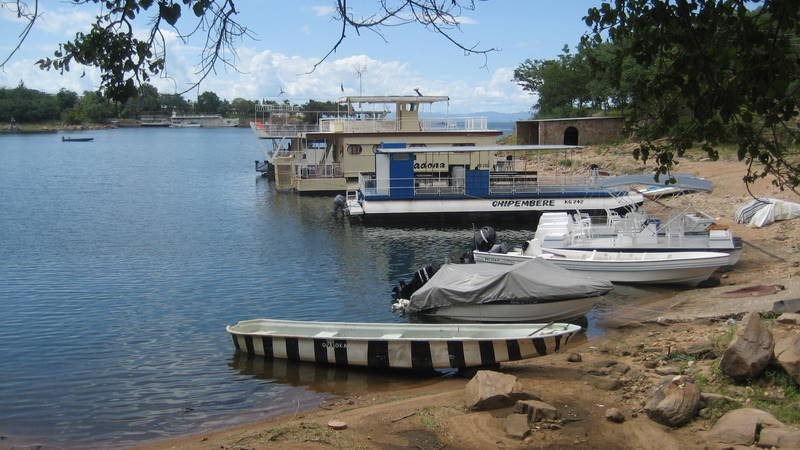 The Southern Belle operated in Lake Kariba for years before Protea refurbished it. 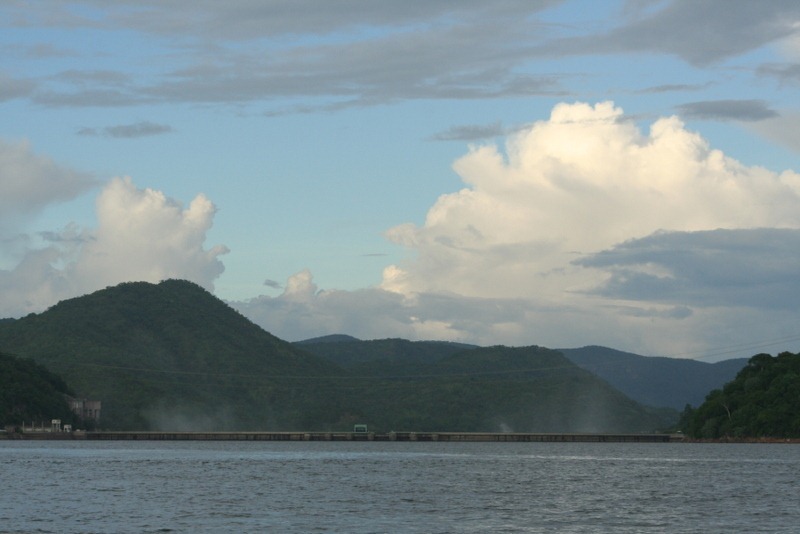 To view or tour Kariba Dam from Siavonga, drive to the Zambia-Zimbabwe border about eight kilometers (five miles) from town, park at the border post, and ask Zambian Immigration for a gate pass. 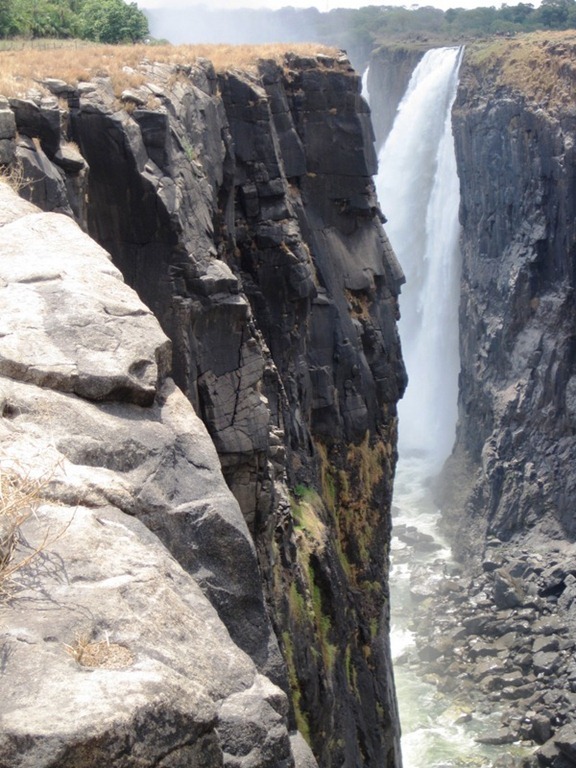 You can walk from there down to the Zambezi River for good views below the dam; the gate pass will permit you to reenter Zambia. 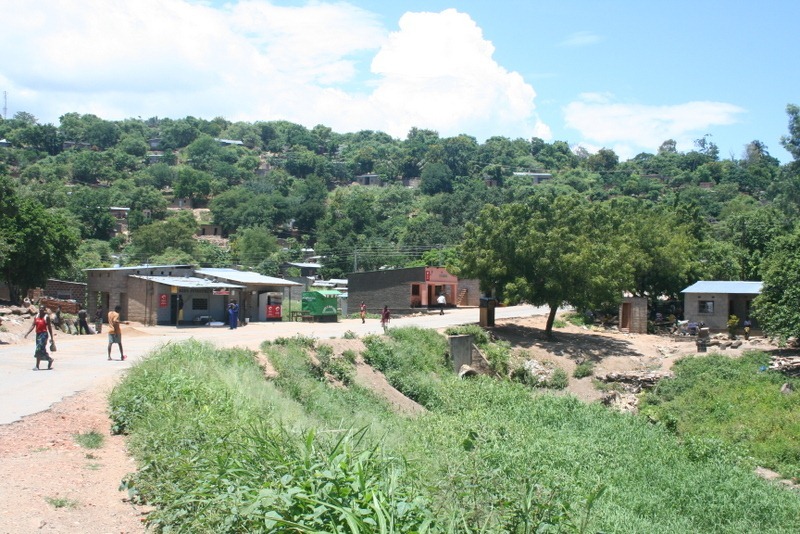 You can also see it from the Zimbabwean side. 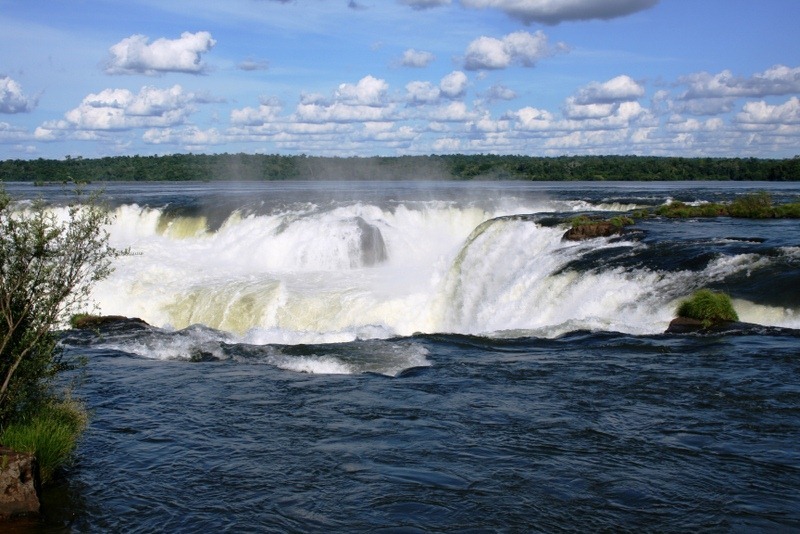 The dam’s spillway opens fully in early February, allowing water that built up from the rainy season to pass down the Zambezi River. 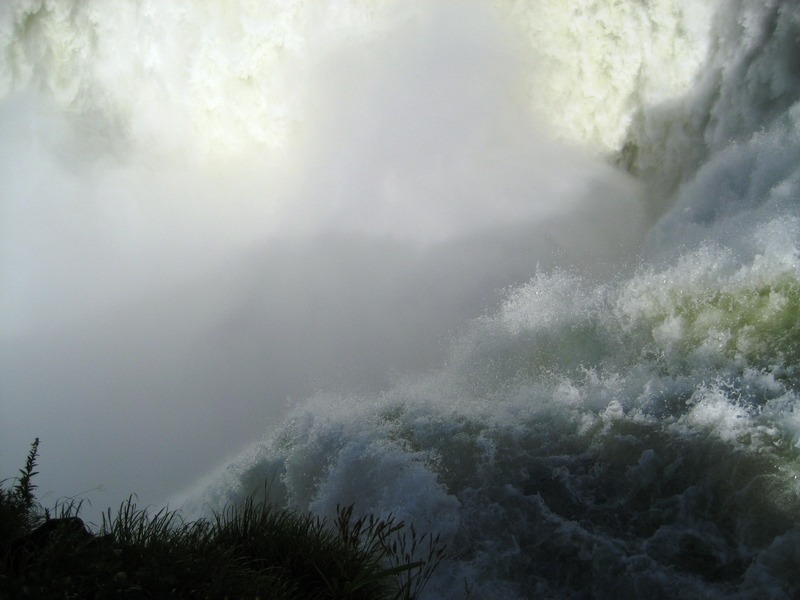 While not as spectacular as Victoria Falls, the dam is still worth a look-see. Constructed between 1955 and 1959 by the Italians, it was being expanded by the Chinese when we visited. The town of Siavonga on the shores of Lake Kariba is a mixture of homes, hotels and resorts, and a central district with local businesses. 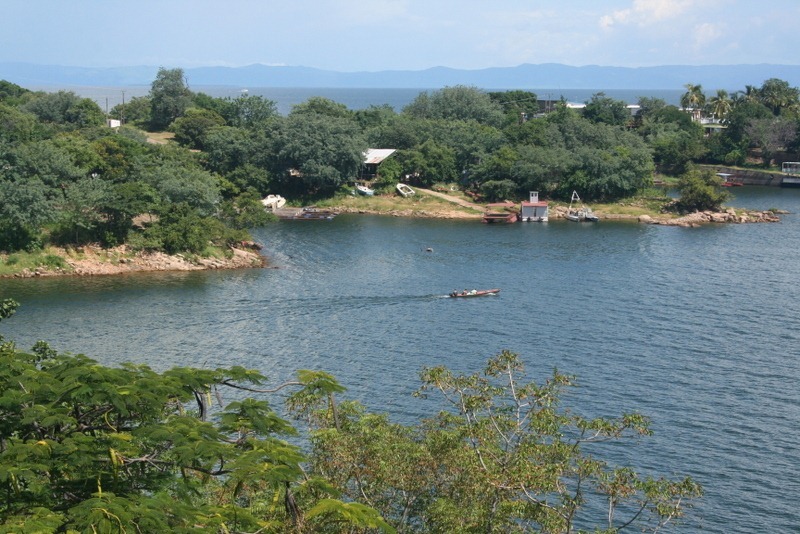 Some wealthier Zambians own second (or third) homes on the lake. 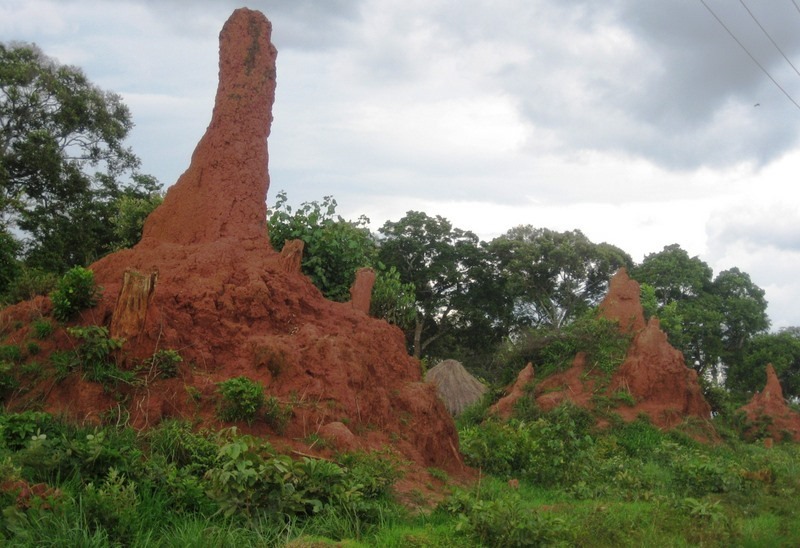 The hilly terrain around the town is ideal for walks and hikes. 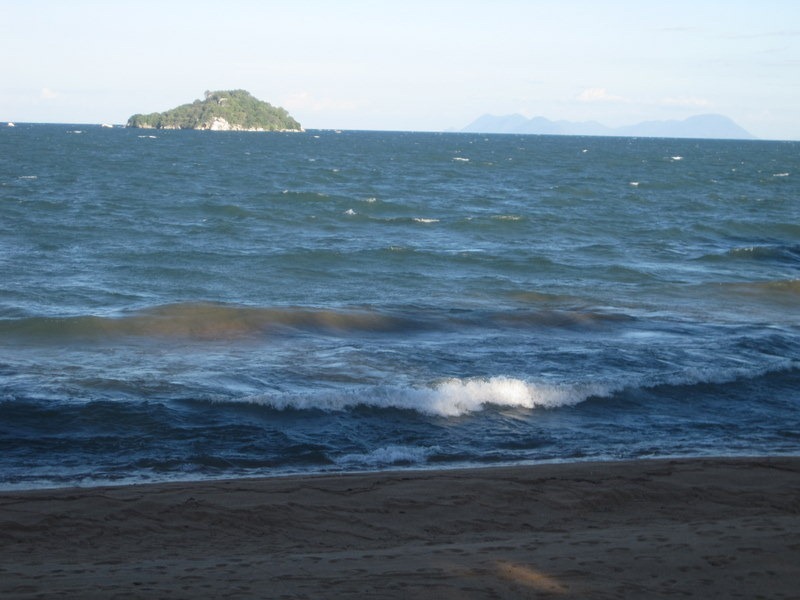 Lake Kariba Inns has a beach walkway that follows the lake and a game walk with great views of the lake. 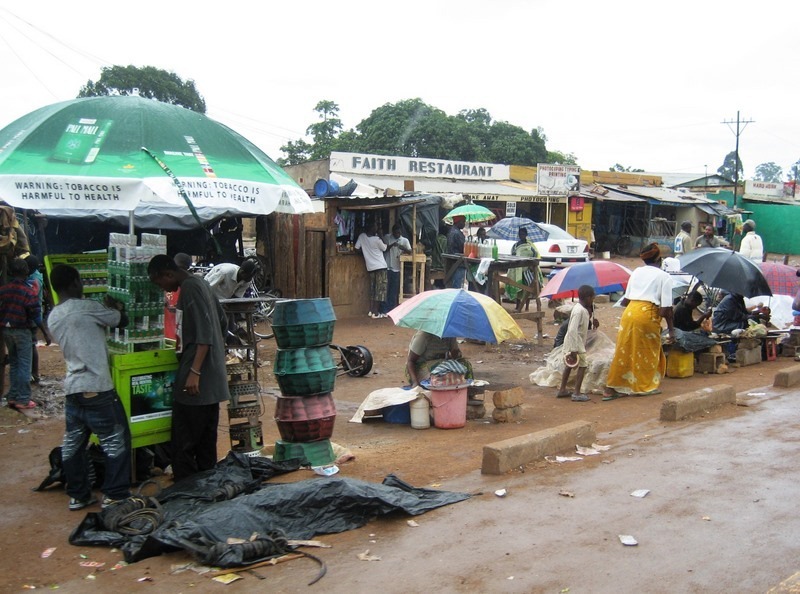 The streets of Siavonga are fun to explore on foot. 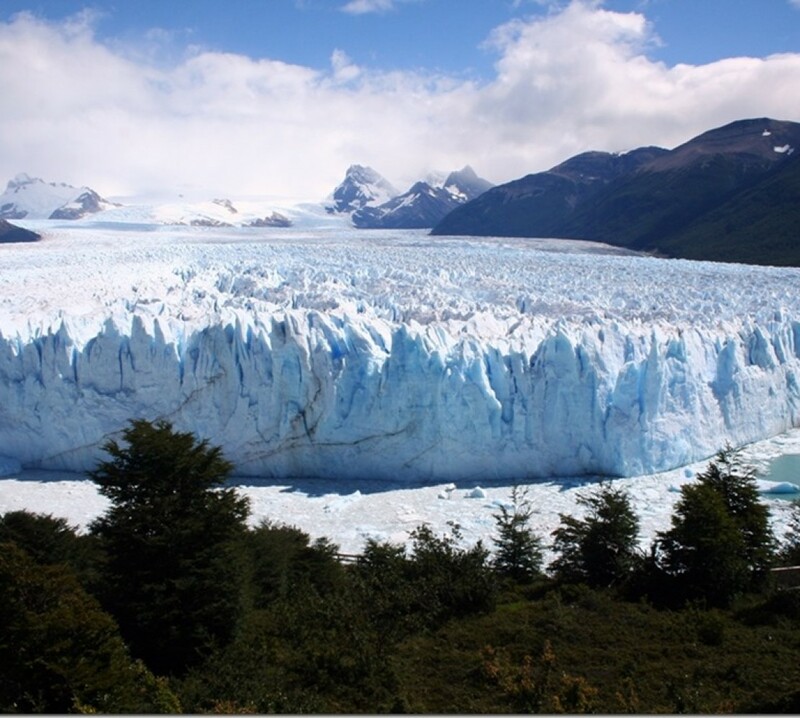 We were told that the area is relatively safe for tourists; however, it’s important to be aware of your surroundings if you choose to tour the town. Leave valuables at the hotel. If you want to enjoy the outdoors in Southern Africa but are not in the mood to go on safari, or you are looking for an extra stop on your visit to Zambia or Zimbabwe, see what Lake Kariba has to offer. 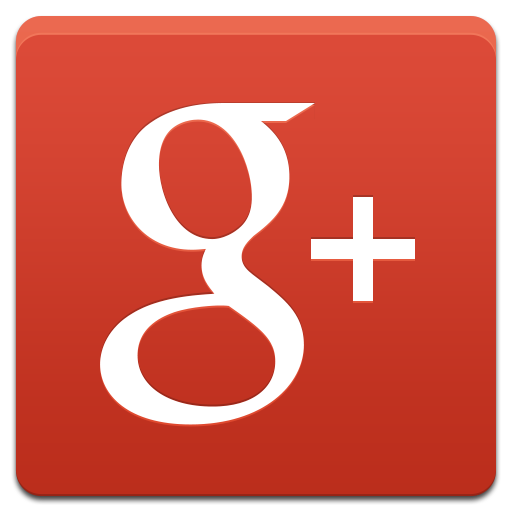 This is an updated version of a blog entry originally posted in February 2011. M.G. Edwards is a writer of books and stories in the mystery, thrill and science fiction-fantasy genres. He also writes travel adventures. He recently published a collection of short stories called Real Dreams: Thirty Years of Short Stories available as an ebook and in print on Amazon.com. 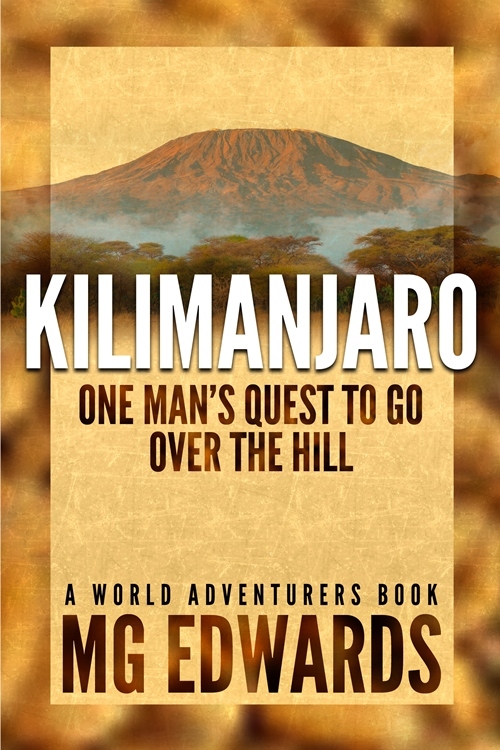 His upcoming travel novel, Kilimanjaro: One Man’s Quest to Go Over the Hill, will be available in March 2012. He lives in Bangkok, Thailand with his wife Jing and son Alex. For books and stories by M.G. Edwards, visit his web site at www.mgedwards.com. 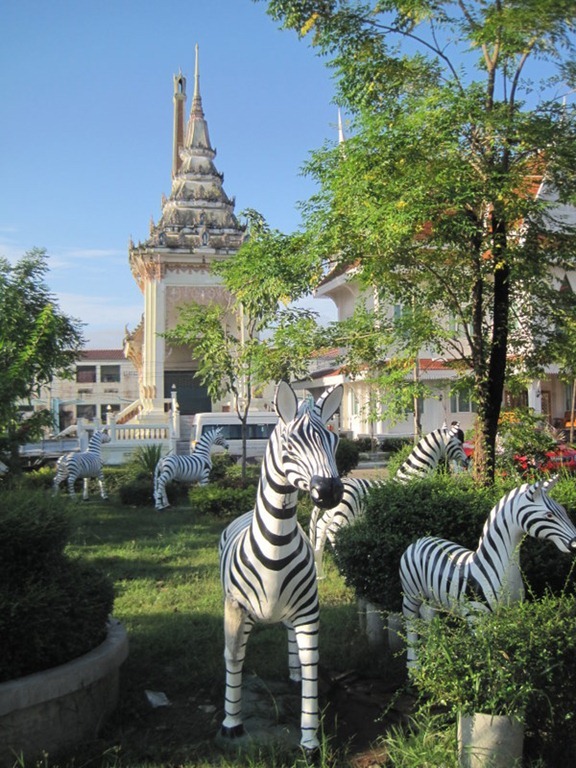 After I moved to Thailand from Africa, I noticed that Thais seemed to be infatuated with zebras. 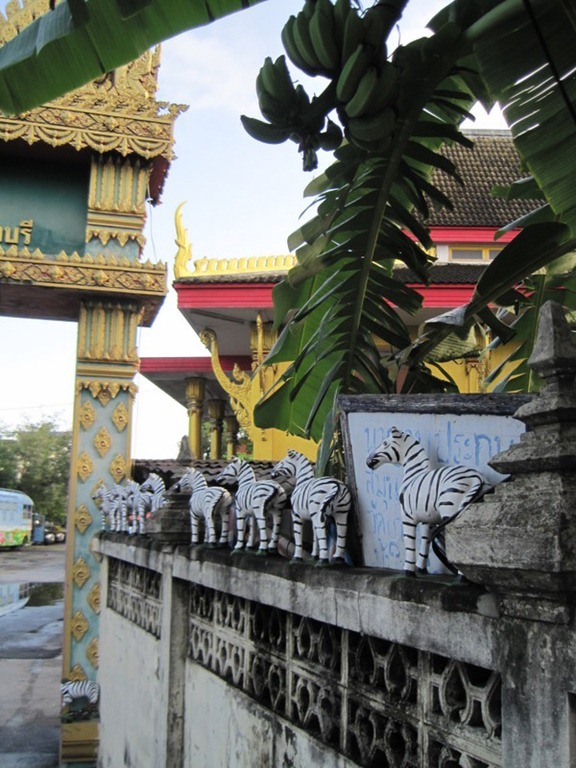 Zebra figurines are very popular in Thailand. I’ve seen them at Buddhist temples, along roadsides, and in markets. 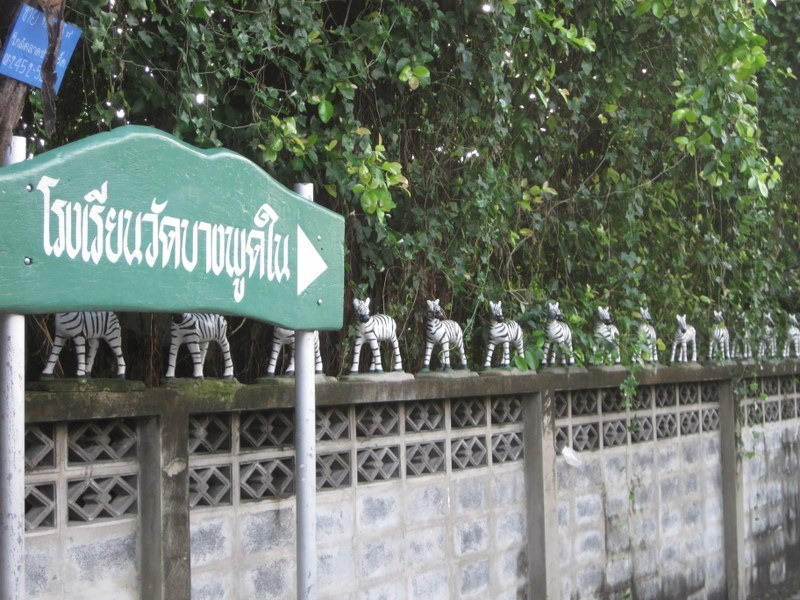 I wondered about this interesting phenomenon and searched the Internet looking for information about Thais’ preoccupation with zebras. I have another theory. 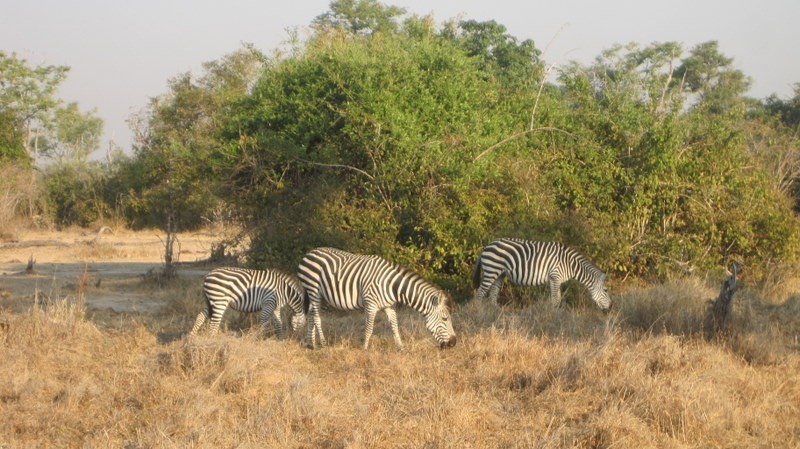 Zebras are black and white, which also happen to be the colors of yin and yang. 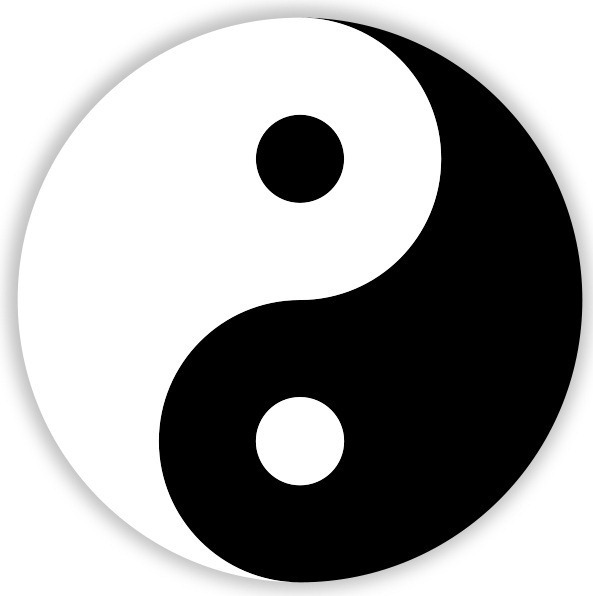 If the story of the monk suggesting the zebra as a symbol of a safe path is true, it’s possible that he may have been influenced by Taoist thought. 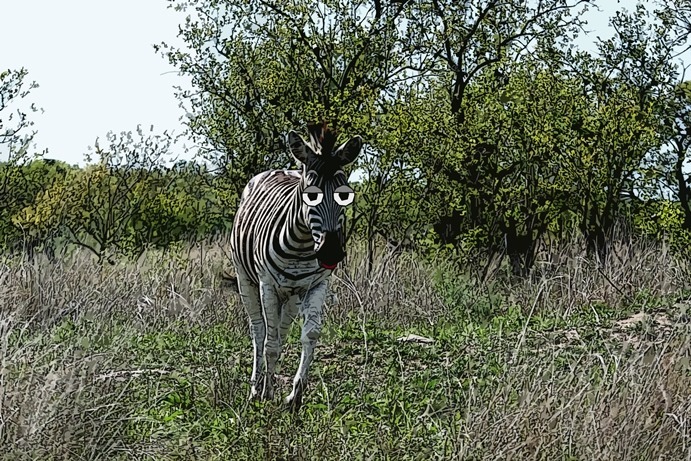 Personally though, I prefer real zebras in the wild. 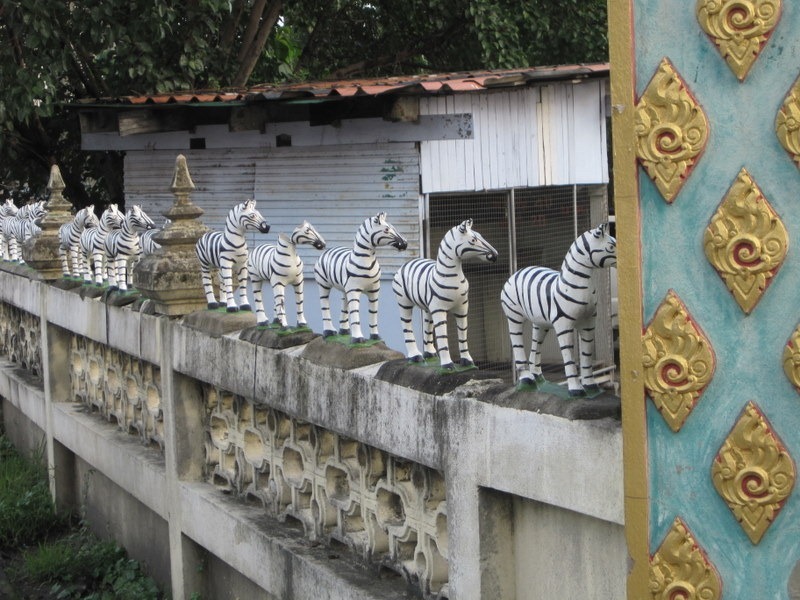 There’s nothing like coming across a herd of zebras and knowing that your path is safe. 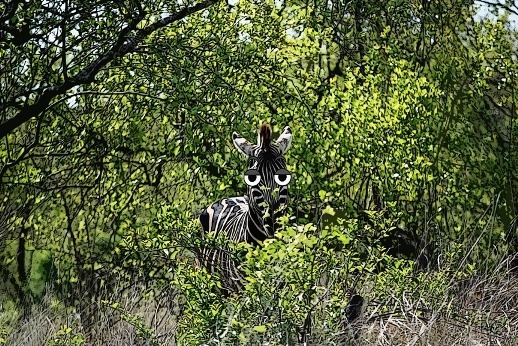 If it weren’t safe, there wouldn’t be a zebra in sight!